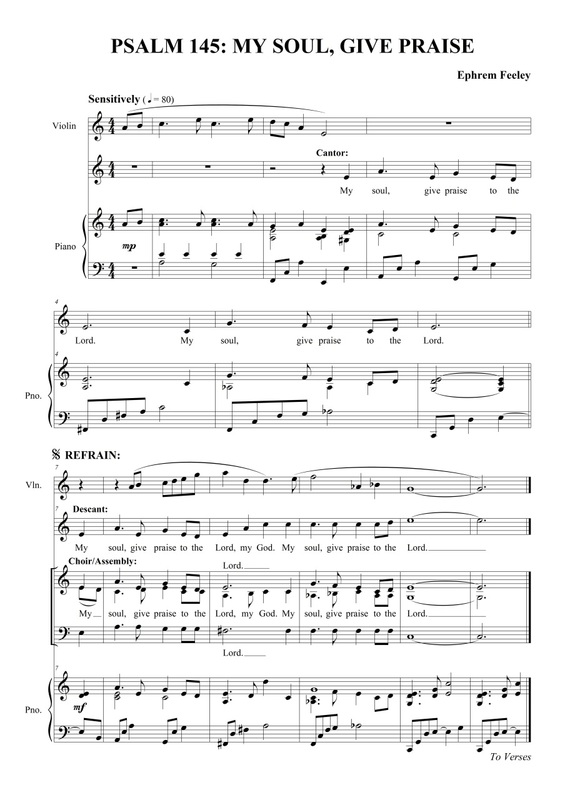 A short, joyful 6/8 refrain makes this psalm easily learnt by the assembly, with dramatic verses for cantor. 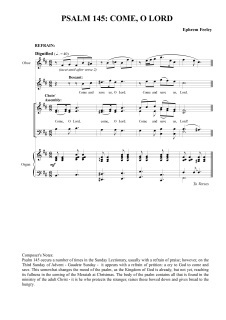 Parts for SATB choir and trumpet add interest. 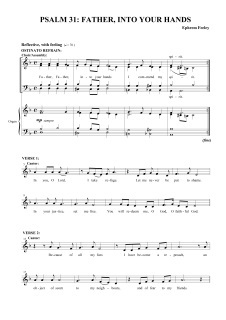 A general psalm especially suitable for Advent, this setting for full choir, cantor and assembly alternates a major refrain with minor verses. 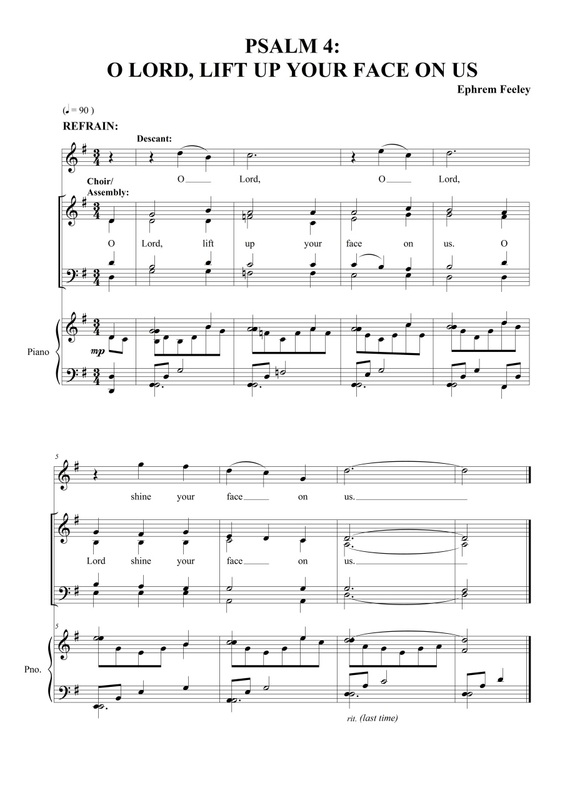 A setting suitable for Lent or the Easter Vigil, this psalm has a warm, melodic refrain for assembly and SAB choir, with piano accompaniment. 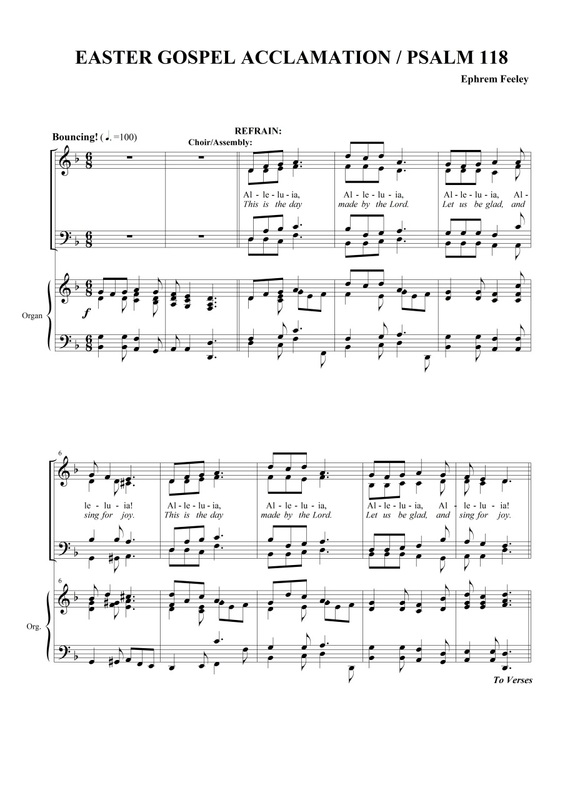 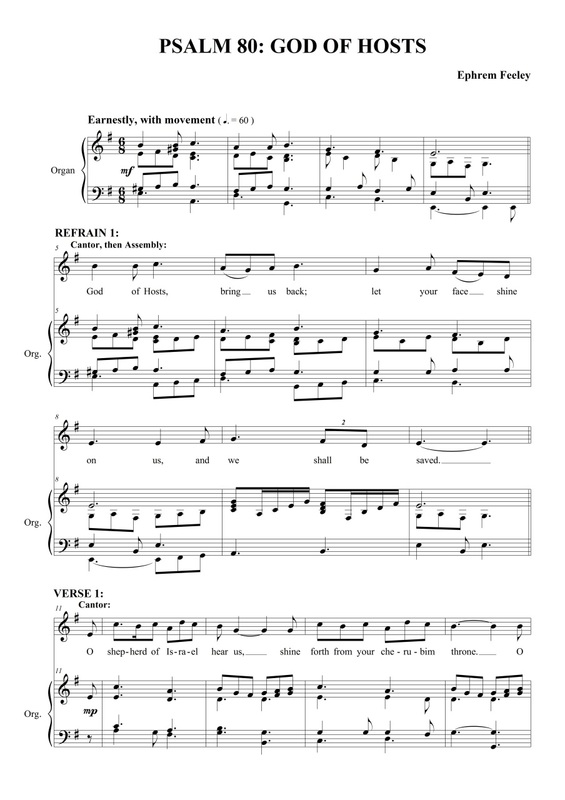 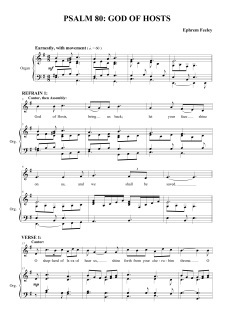 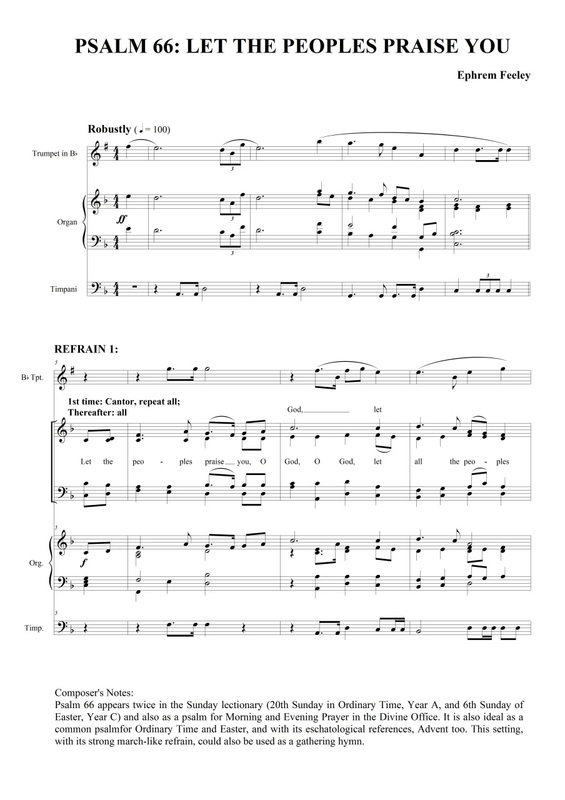 A very simple refrain for unison choir, descant, assembly and organ with psalm-tone verses. 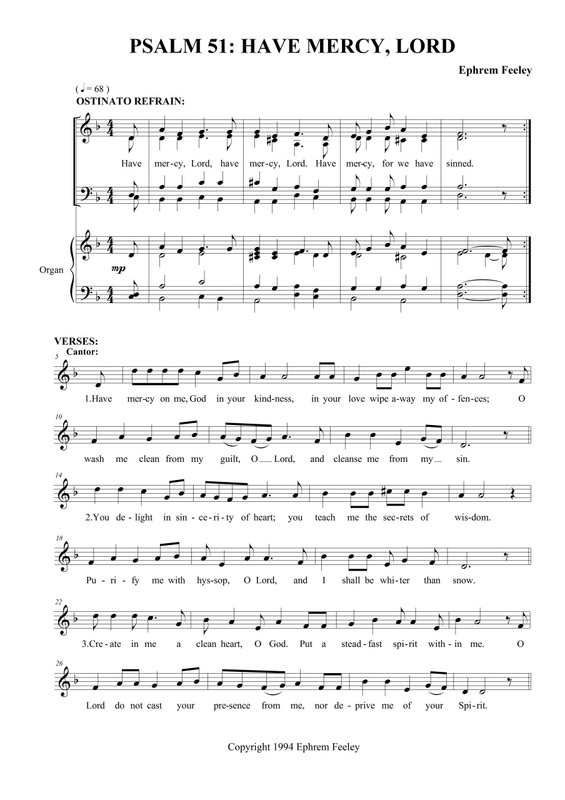 Suitable as a common psalm for Ordinary Time or Morning Prayer. 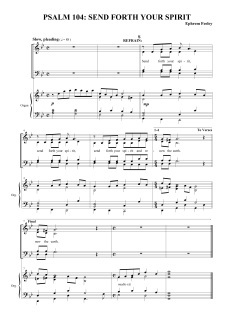 A simple, gentle setting in 6/8 time with parts for full choir, cantor and organ. 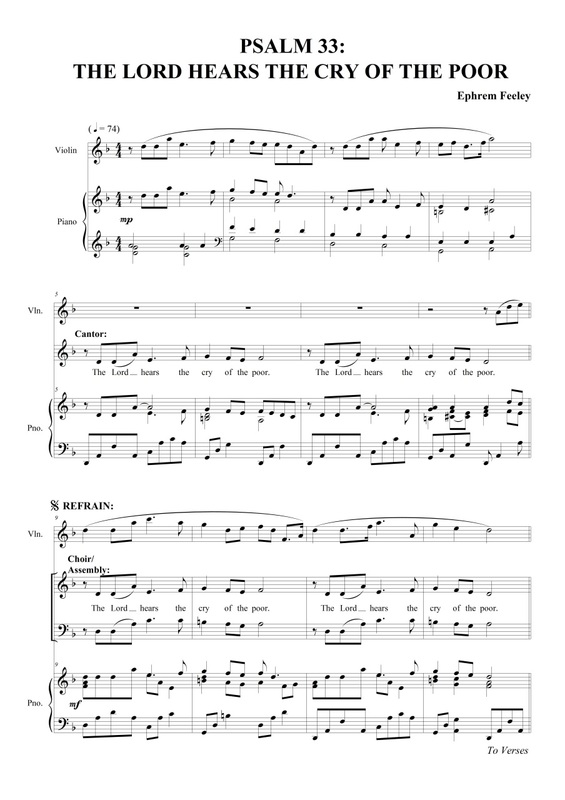 Another setting of this psalm, with an easy refrain, with parts for SATB choir, cantor and organ. 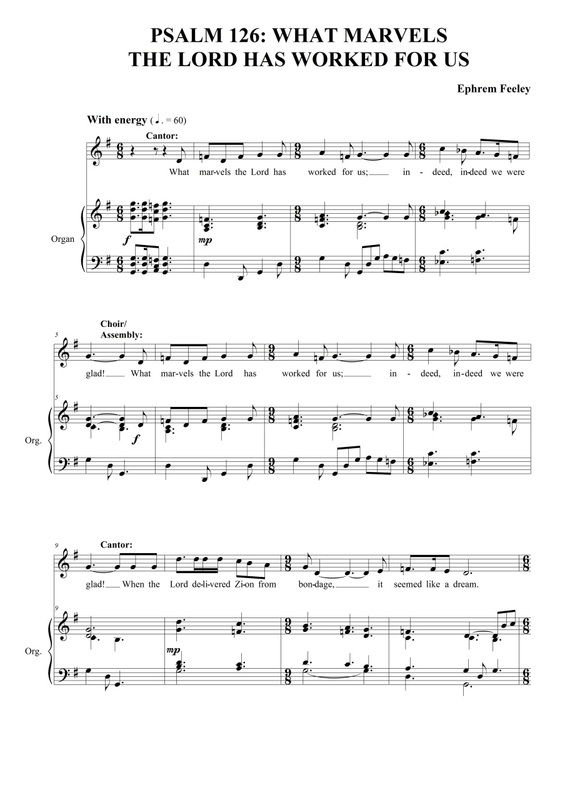 Popular for over a decade, this award-winning setting of the well-known psalm has a memorable refrain in compound time, and interesting yet lyrical verses. 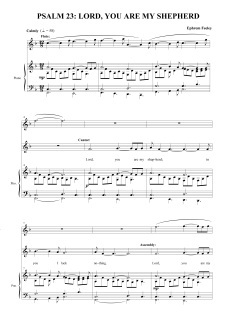 Scored for SAB choir, assembly, cantor, flute and piano. 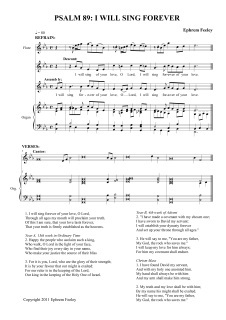 An easy refrain for SAB choir and assembly with a rising 7th, and psalm-tone verses for cantor. 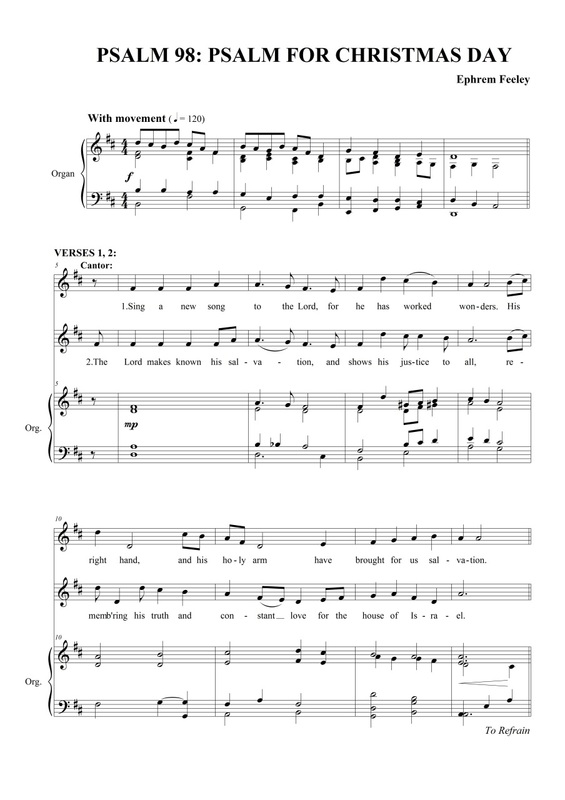 A robust setting of this Advent psalm for assembly, SATB choir and organ, with psalm-tone verses for cantor. 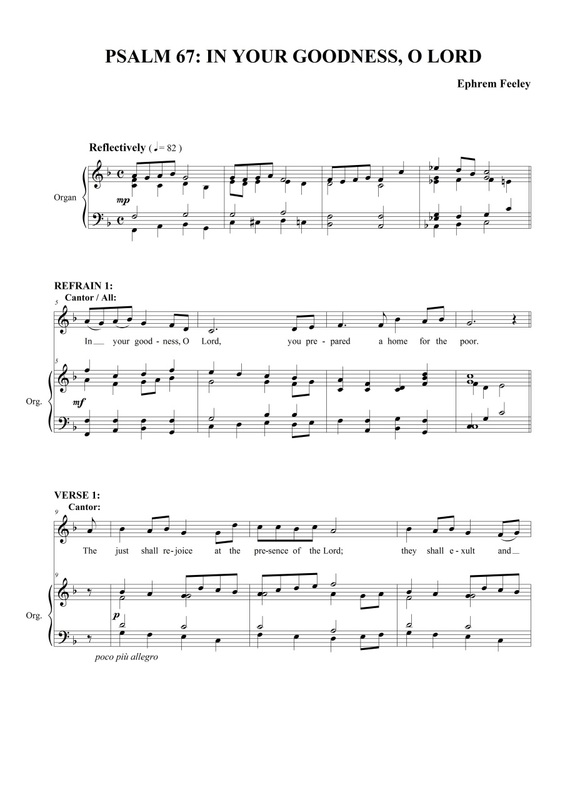 A strong setting of this psalm for the Feast of the Presentation of the Lord, and as a common psalm for Advent or the Feast of Christ the King. 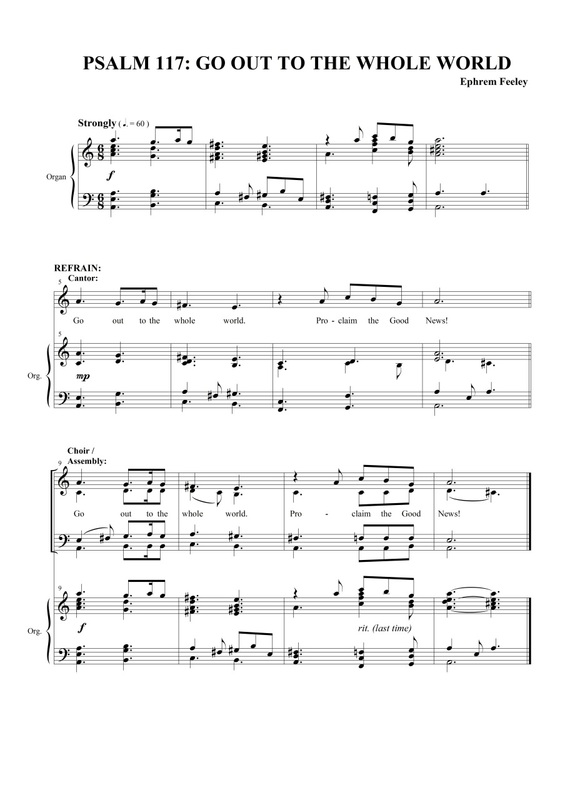 Scored for SATB choir, assembly, cantor, trumpet and organ. 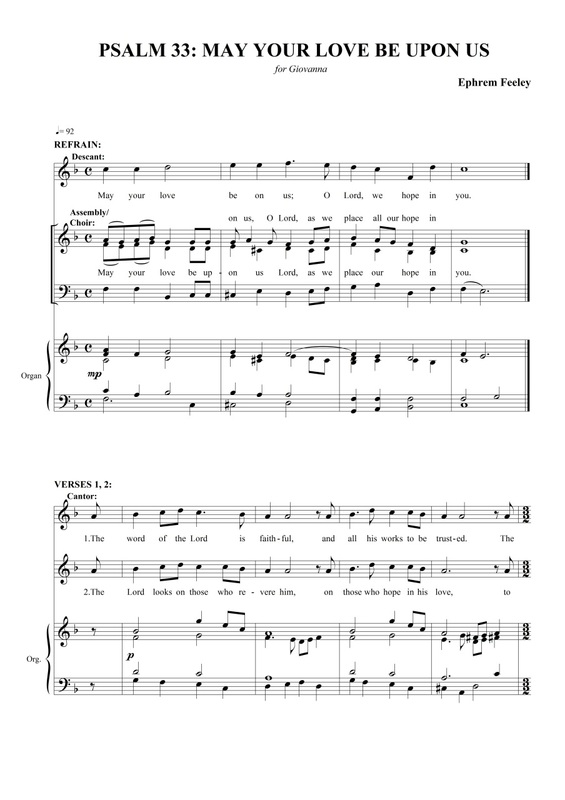 A lyrical psalm with a very simple refrain, scored for unison choir, cantor and organ. 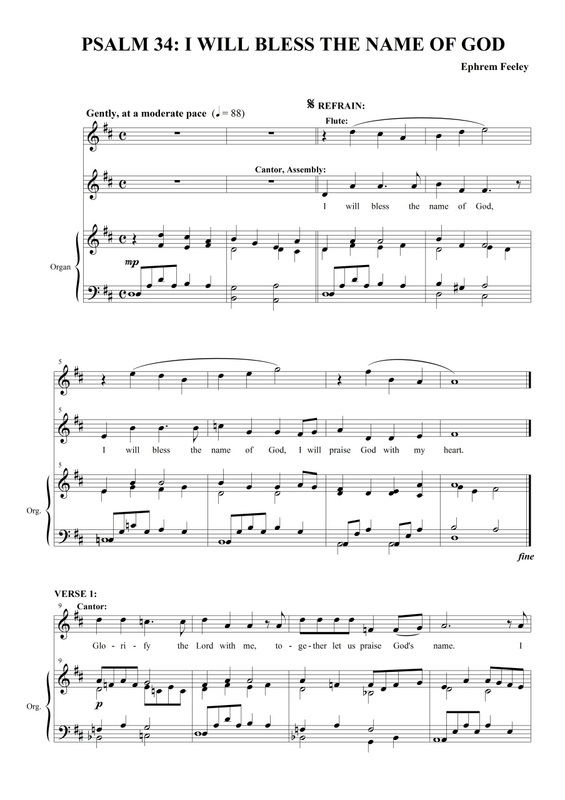 Suitable as a Lenten common psalm, or throughout the year, this gentle setting is scored for full choir, cantor and piano. 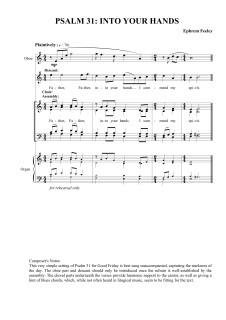 Suitable for the Feast of the Holy Family, throughout Advent and into Ordinary Time, this psalm features a unison refrain which can be sung in canon underneath verses. 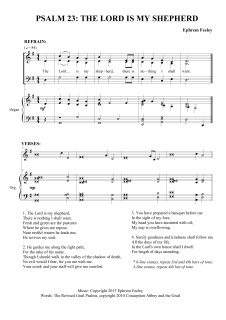 A pleading, minor key refrain, with dissonances in the verses captures the anguish of this psalm. 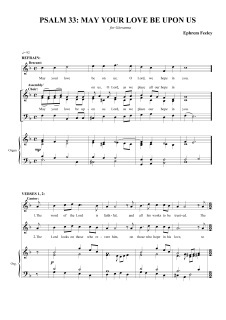 Scored for full choir, schola, cantor and organ. 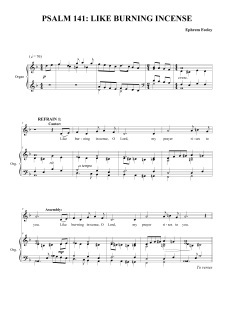 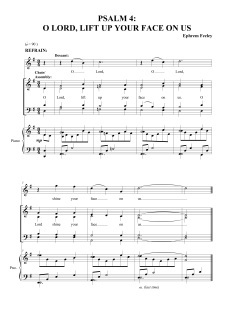 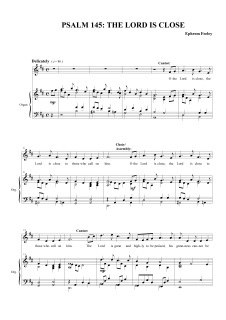 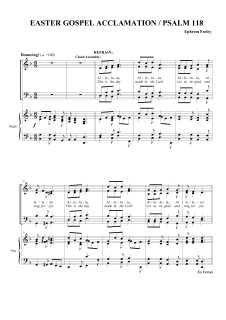 This setting of the psalm for Good Friday features an ostinato refrain, which may be sung unaccompanied highlighting the starkness of the day, with verses for cantor. 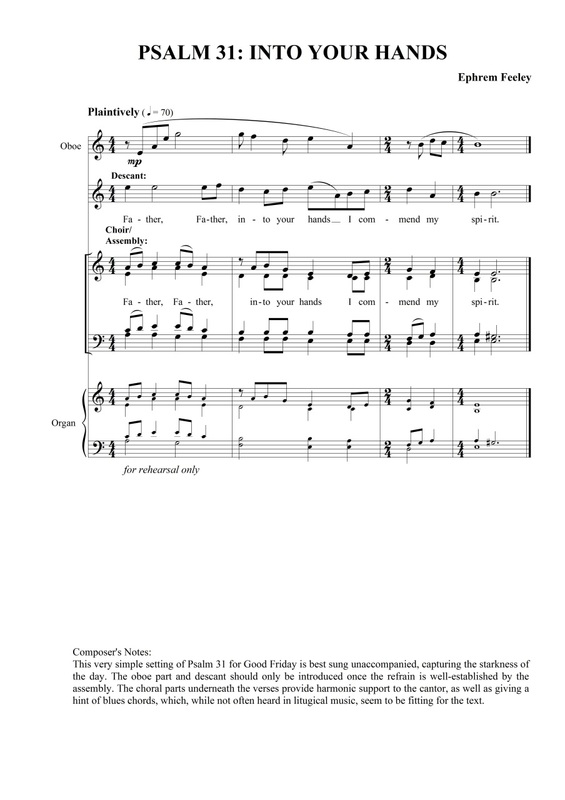 This setting of the responsorial psalm for Good Friday is best sung by unaccompanied SATB choir and assembly, with optional oboe and organ parts. 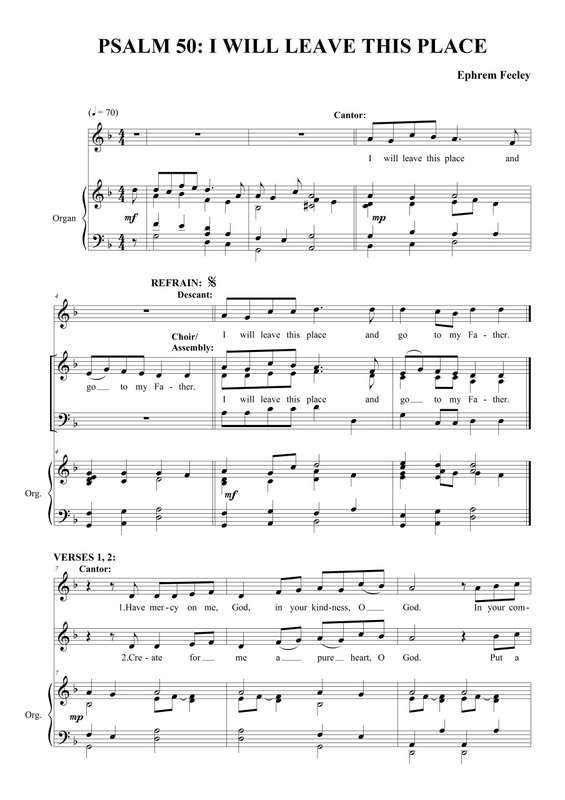 Hints of blues chords in the verses highlight the angst in the words of this powerful psalm. 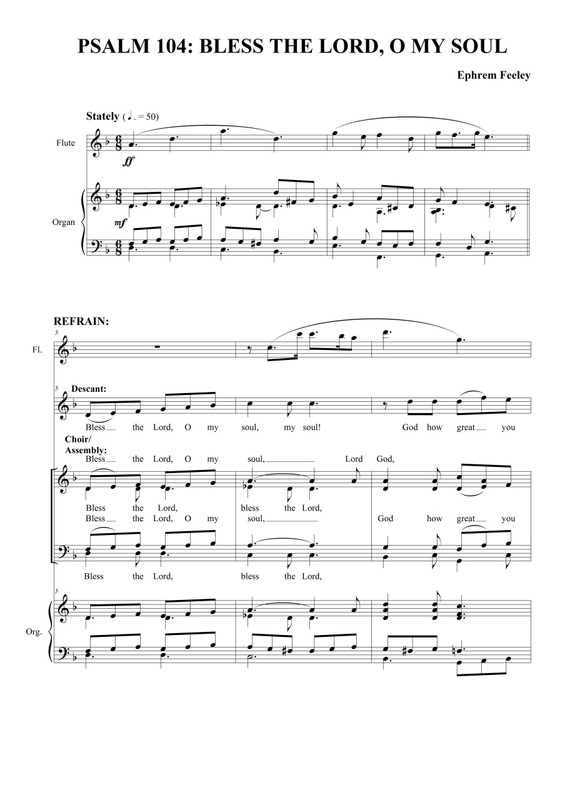 Suitable as a common psalm for Lent, this has a simple refrain scored for SAB choir, assembly and organ, with verses for cantor. 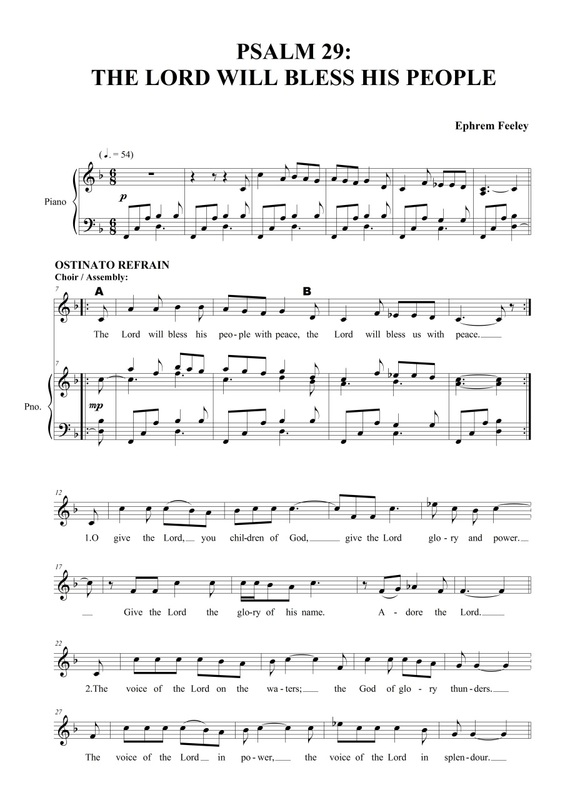 Occurring several times in the Lectionary, this lyrical psalm is also ideal for weddings and services of blessing. 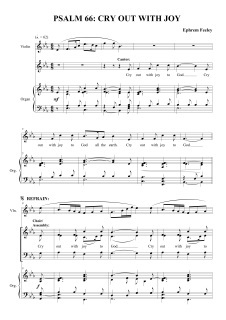 Scored for SAB choir, descant, cantor and organ. 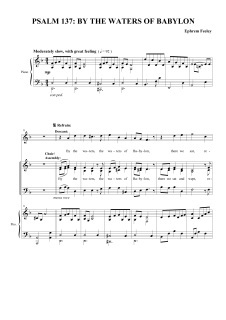 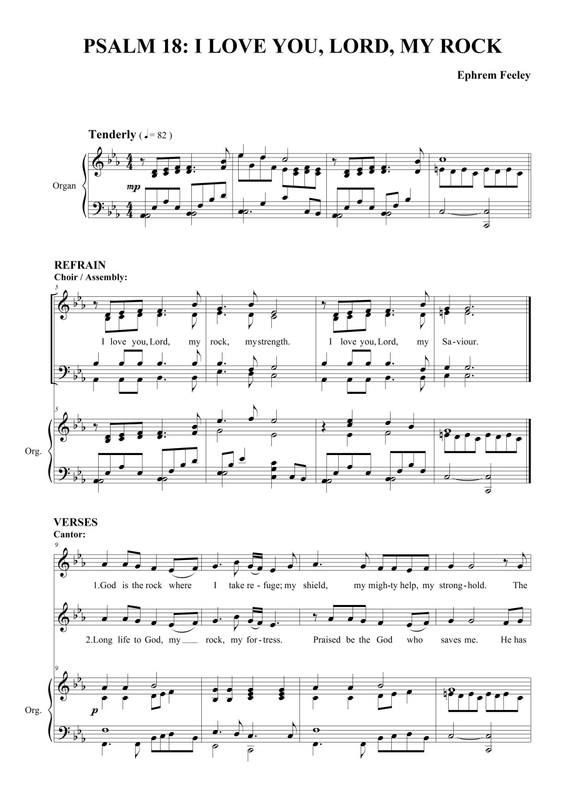 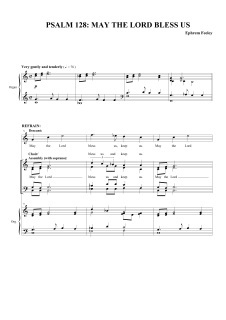 Ideal for smaller choirs, this setting is scored for SB choir, piano, and violin, with attractive verses for cantor and a very easy assembly refrain. 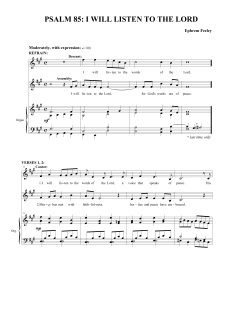 Suitable for all times in the church year. 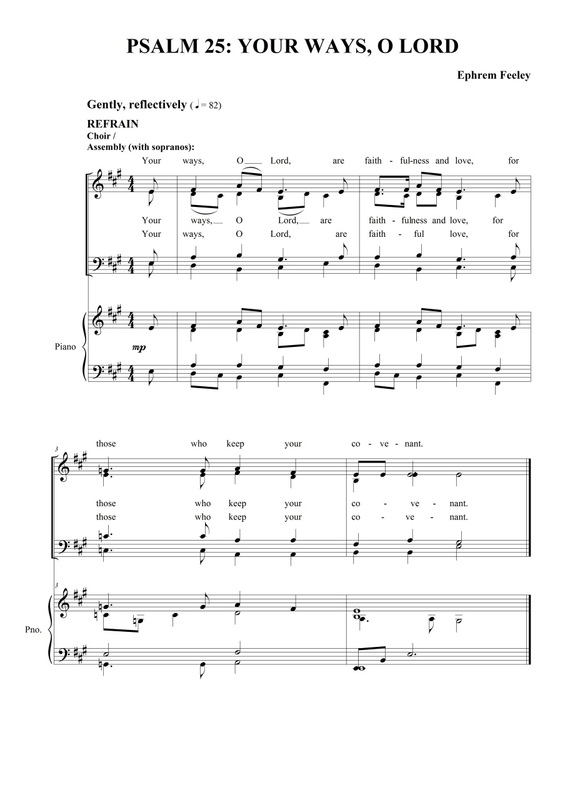 A very simple refrain for unison choir and assembly, with psalm-tone verses for cantor. 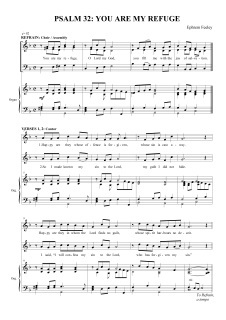 Suitable for general use. 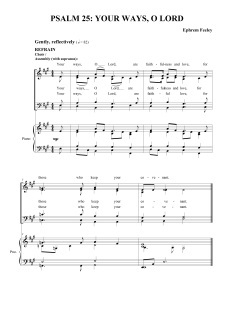 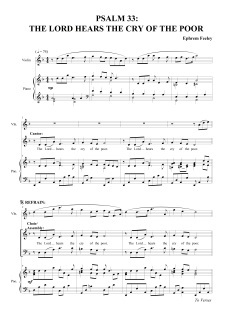 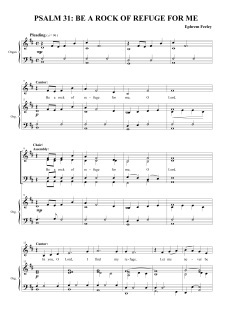 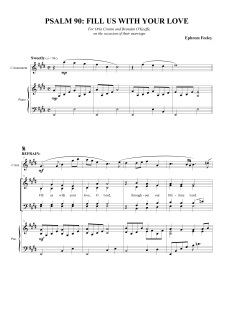 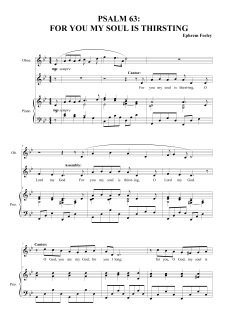 Written for children's choir in 1997, this simple and appealing setting is scored for unison choir, assembly and organ, with optional flute part. 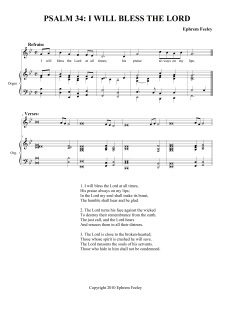 From the album Here in Christ we Gather, this versatile psalm often appears in the Lectionary, and can be also sung at communion time. 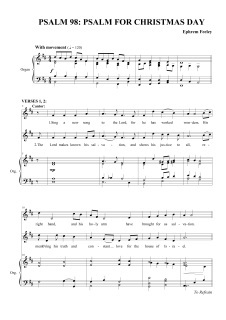 Scored for SAB choir, assembly, descant, cantor and organ. 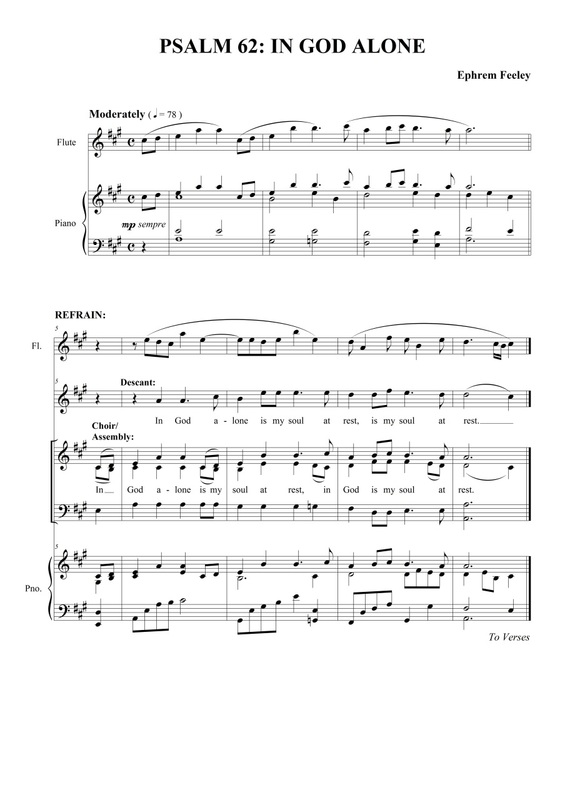 This powerful setting of Psalm 40, with its plaintive oboe and chromatic harmonies, captures the anguish of the afflicted, who finds security only in God's love. 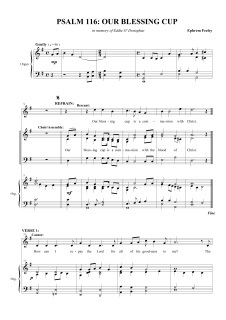 Scored for cantor, SAB choir, assembly, piano and oboe. 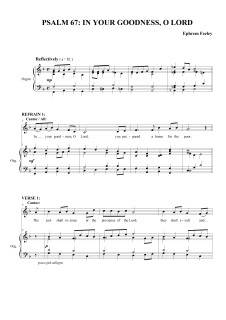 A simple refrain for assembly makes this a very useful psalm for the Easter Vigil and other times in the year when it appears in the Lectionary. 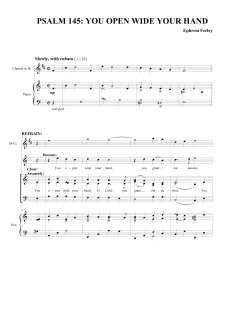 Scored for cantor, assembly and piano. 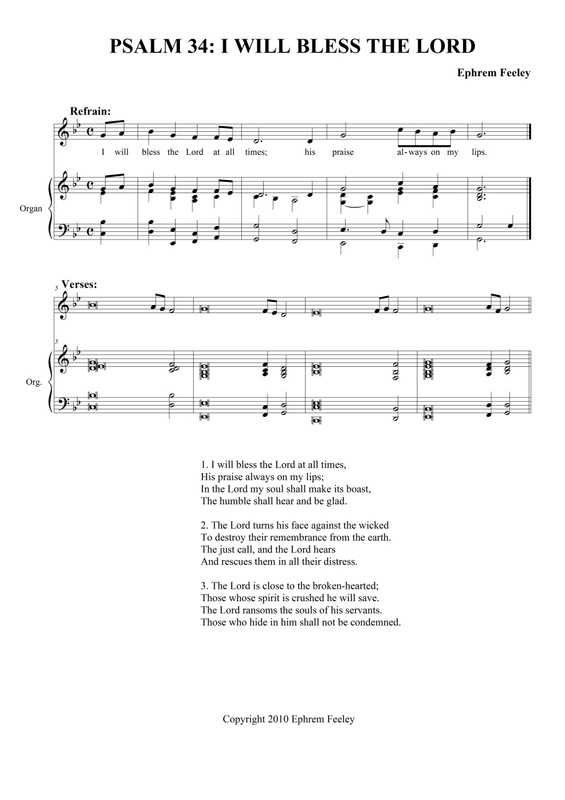 A robust setting in 6/8 of this psalm for the Feast of the Ascension of the Lord. 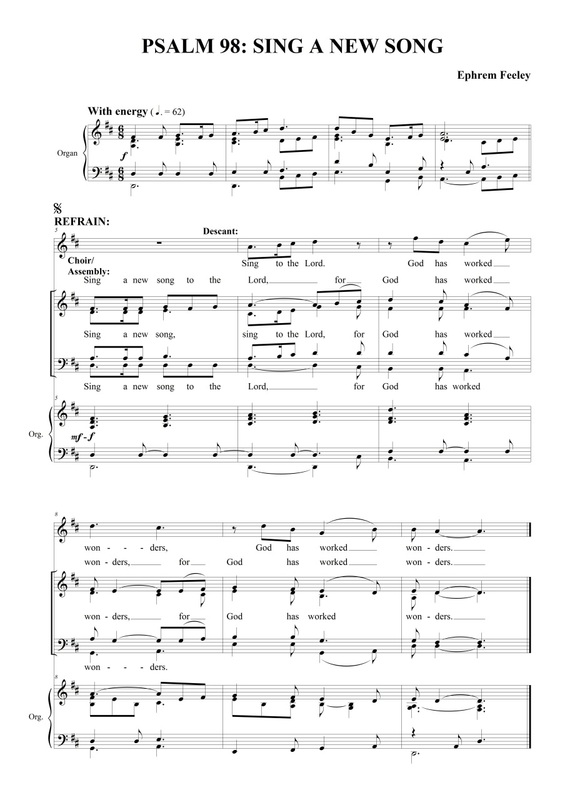 Scored for cantor, SATB choir, assembly, organ and trumpet, this psalm is an invaluable addition to your Eastertide repertoire. 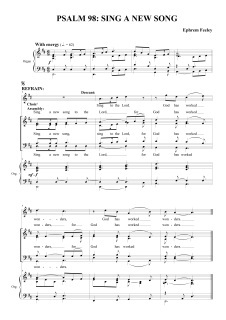 Suitable for Ash Wednesday, Penitential Services, and throughout the season of Lent, this psalm is scored for cantor, assembly, SATB choir and organ, with an ostinato refrain, which may be sung unaccompanied. 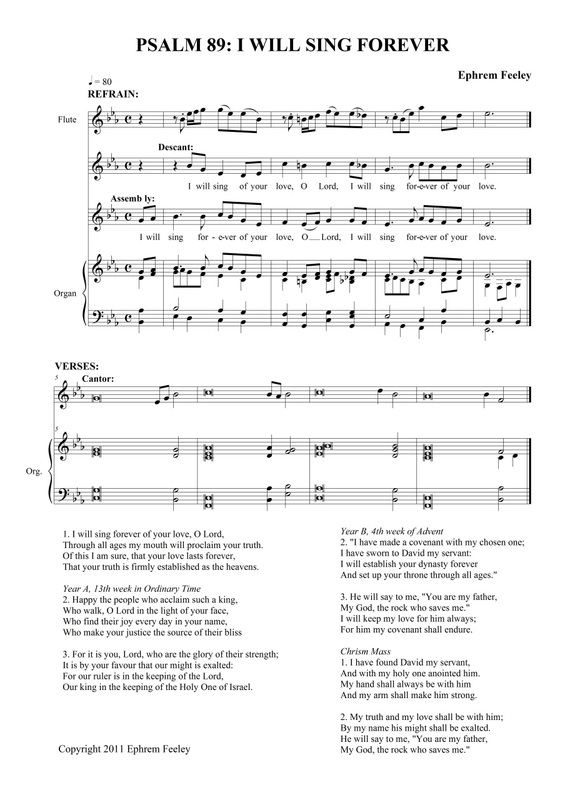 A reflective setting of Psalm 51, suitable for Ash Wednesday and throughout Lent. 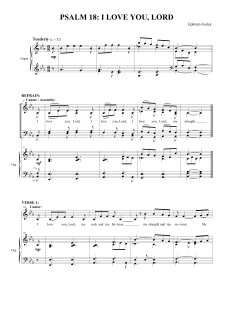 Scored for cantor, assembly, SAB choir, descant, and organ. 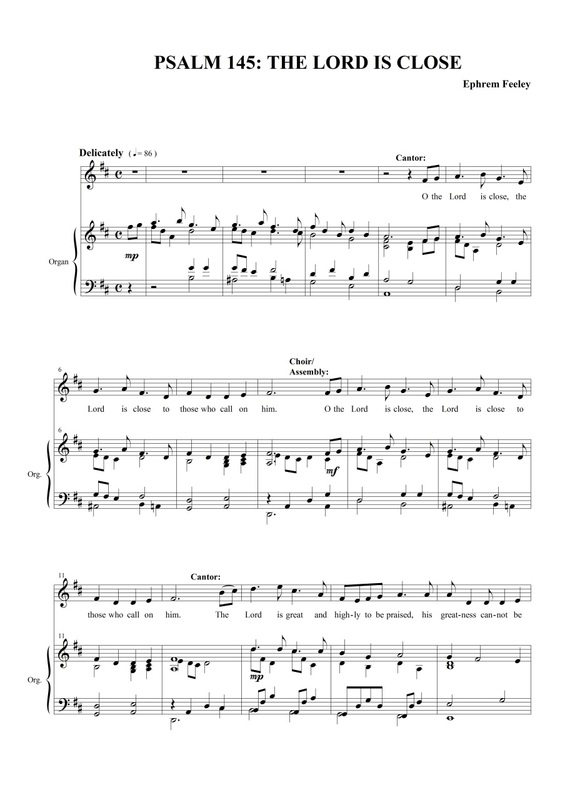 A very simple, elegant setting makes this psalm suitable for young and old alike. 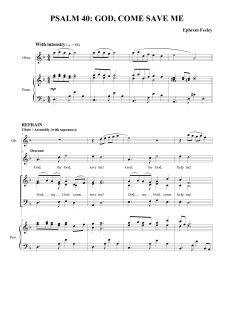 Scored for cantor, assembly, SAB choir, descant, flute and organ. 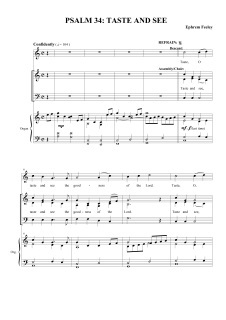 A lyrical setting of this psalm, suitable for Morning Prayer, and as a common psalm or hymn throughout the year.The plaintive oboe part captures the longing of the psalmist for God. 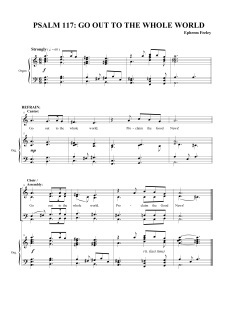 Scored for cantor, SAB choir, descant, oboe and piano. 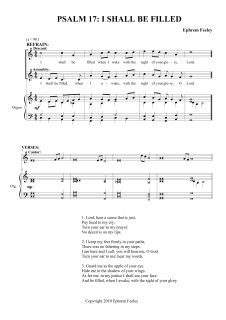 This attractive, award-winning psalm setting can also be sung as a reflective piece at Morning Prayer, communion time, services of healing and general prayer services. 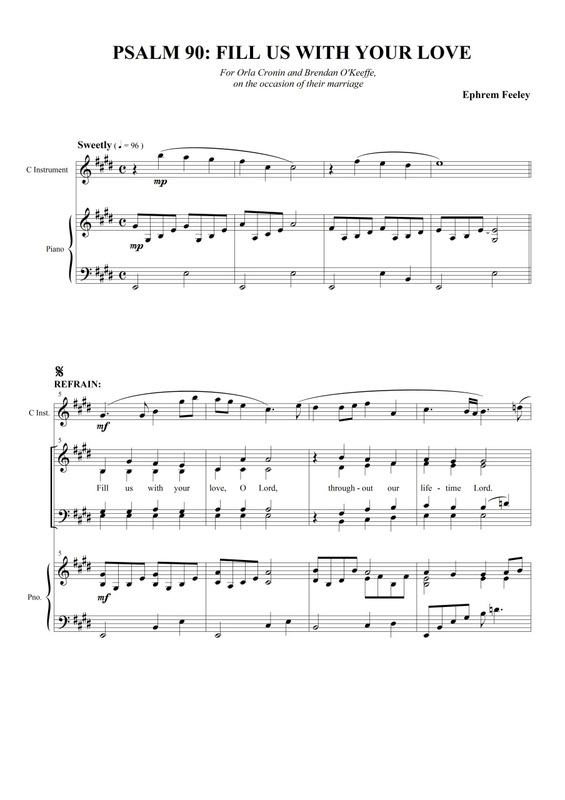 Scored for cantor, assembly, SAB choir, descant, violin and piano. 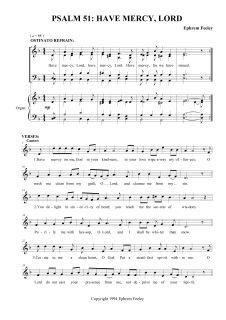 A lively psalm for Ordinary Time and Easter, scored for cantor, SAB choir, descant, violin and organ. 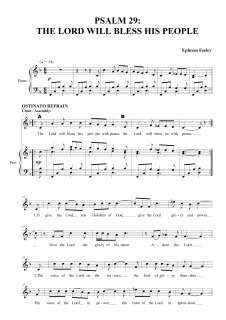 A strong setting of a text that is often found in the Lectionary and Divine Office makes this an ideal common psalm throughout the year, or as a stately gathering hymn. 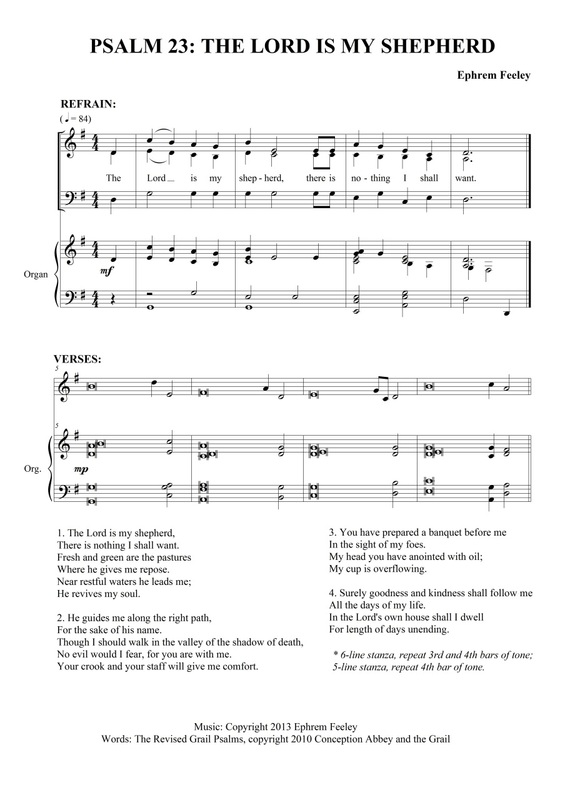 A simple, attractive psalm that shows God's care for the oppressed. 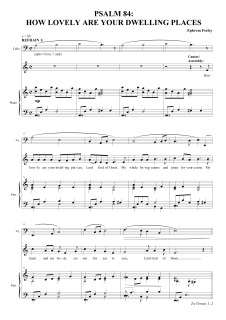 Scored for cantor, assembly, SB choir, descant and organ. 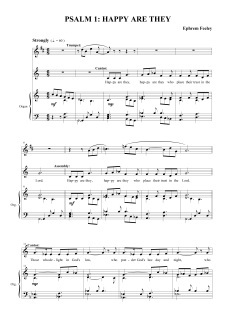 A strong setting of the psalm for the First Sunday of Advent, capturing a longing for the restoration of the Kingdom of God. 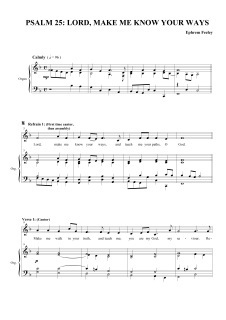 Scored for cantor, assembly, SAB choir and organ. 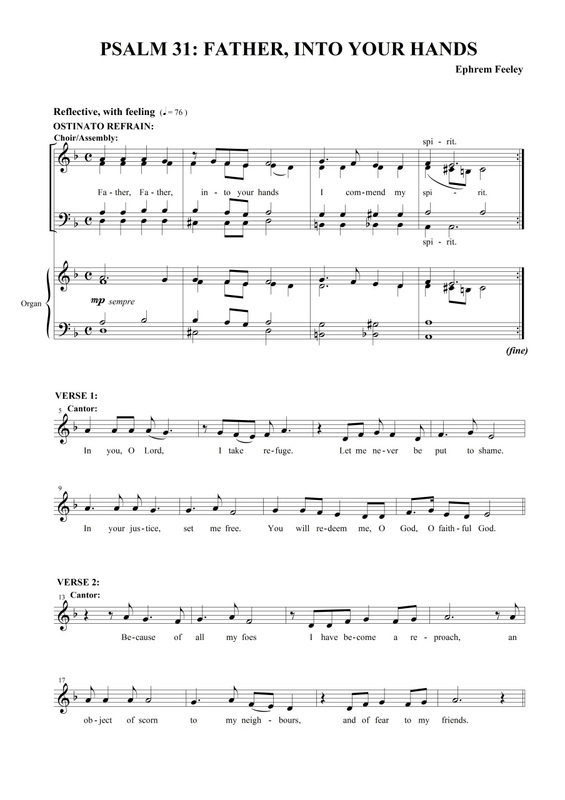 A setting of this pilgrimage psalm for larger performing forces: assembly, SATB choir, two cantors, cello and piano. 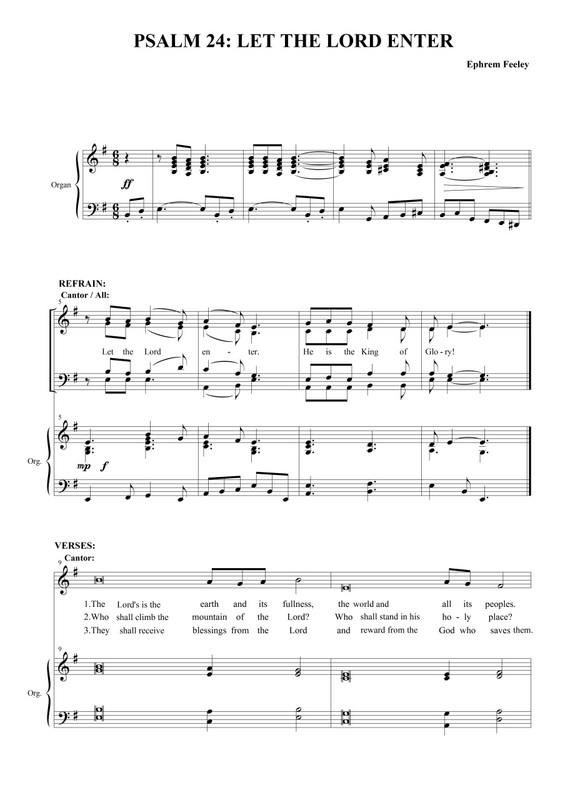 With its eschatological dimension, this is an ideal psalm for the season of Advent, with lyrical verses for cantor, unison assembly, descant and organ. 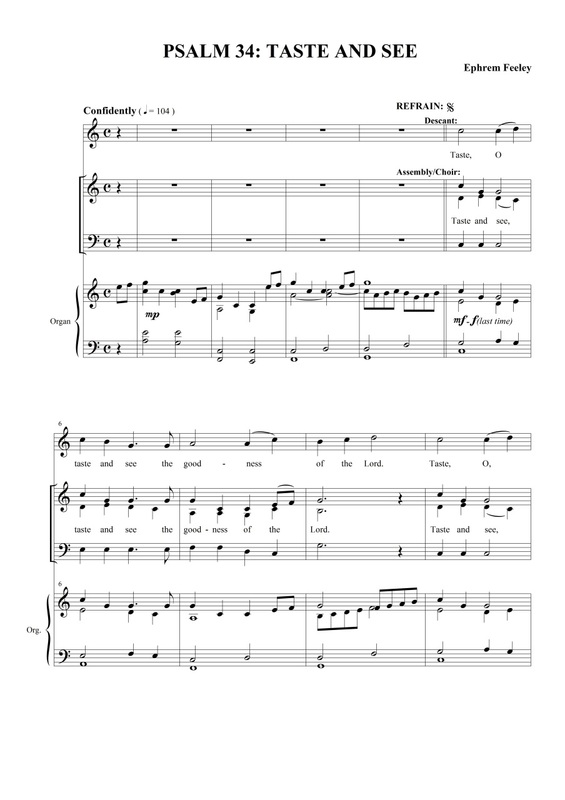 A multi-use psalm for Advent, the Chrism Mass and Ordinary Time, this simple setting has a lyrical refrain for assembly (with descant), psalm-tone verses for cantor, and organ and flute accompaniment. 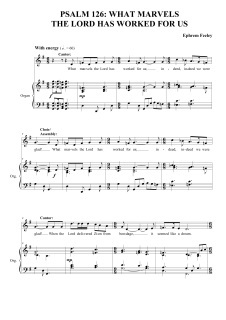 An attractive setting for cantor, assembly, SATB choir, C instrument and piano, suitable for weddings, Morning and Evening Prayer, and general use. 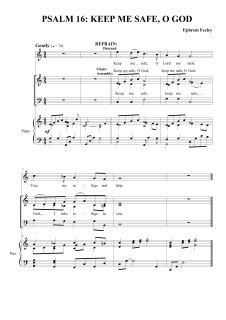 A sprightly psalm using a motif from Angels we Have Heard on High, this is an ideal psalm for Christmas Day, for cantor, assembly, descant and organ. 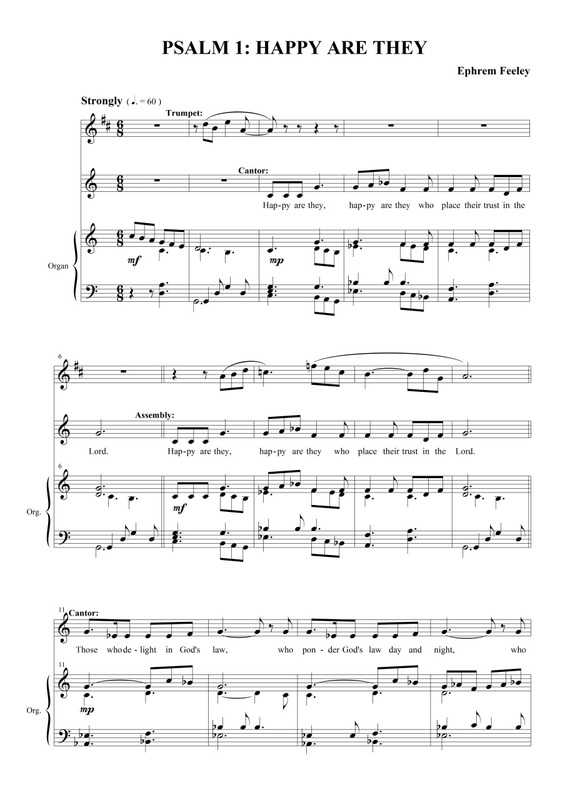 A simple, yet effective setting of this psalm for assembly, SATB choir, cantor, piano and flute, with many uses: as a common psalm for Easter season, funerals, and rites of initiation, or as a gentle gathering or communion song. 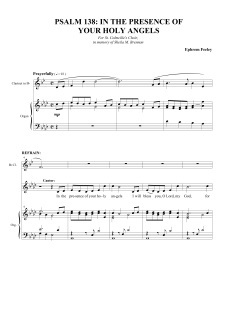 Suitable for confirmations, baptisms, Pentecost or where the readings speak of creation or the Holy Spirit, this setting for assembly, cantor, SATB choir, flute and organ couples a lyrical refrain with strong rhythmic verses. 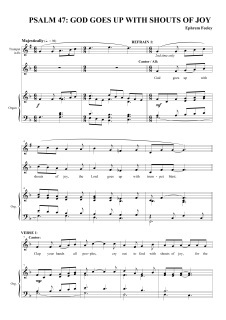 Scored for two cantors, assembly, SATB choir and organ, this hypnotic setting is ideal for Pentecost, baptisms and confirmations. 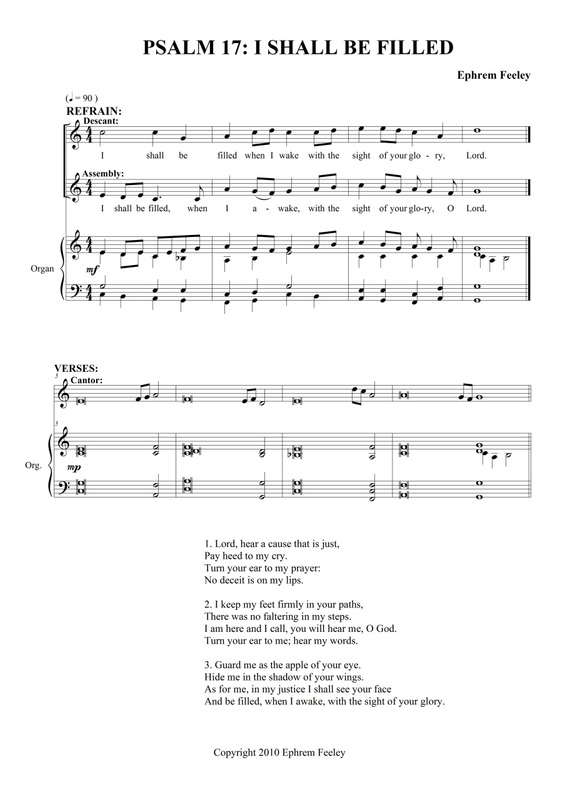 A simple refrain for assembly, SAB choir, and descant, with lyrical verses for cantor make this psalm suitable for Holy Thursday, the Feast of the Body and Blood of the Lord, feasts of martyrs, and St Patrick's Day, as well as being a communion hymn for general use. 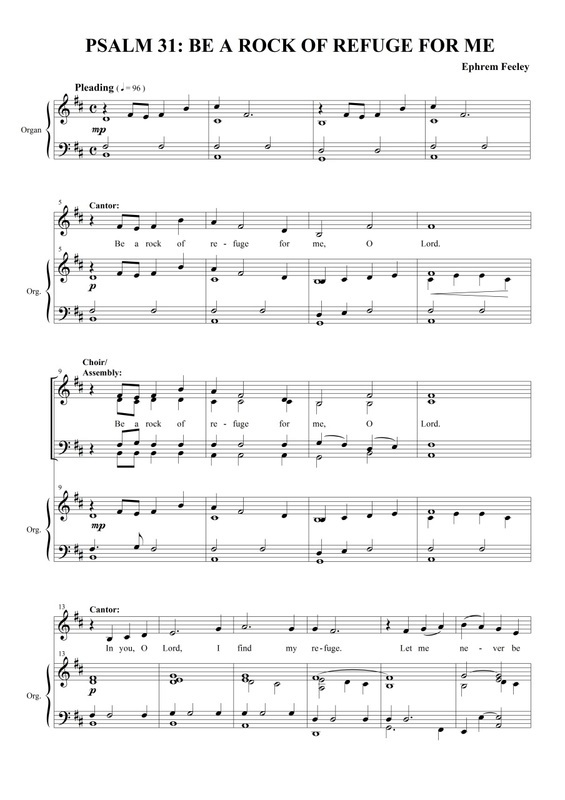 With a short, robust refrain for assembly, SATB choir with organ accompaniment, and simple, pithy verses for cantor, this psalm is suitable for Mission Sunday, St Patrick's Day and other occasions. 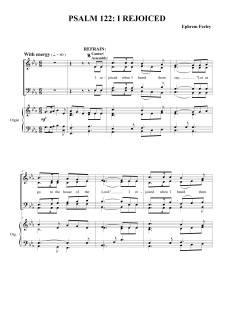 Used in the Jubilee 2000 Wrexham Diocese celebrations, and popular ever since, this joyful psalm can be sung either as a Gospel Acclamation, or as a psalm throughout the Easter seaon. 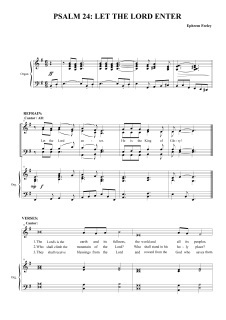 Alternative words make it equally suitable as a strong gathering hymn. 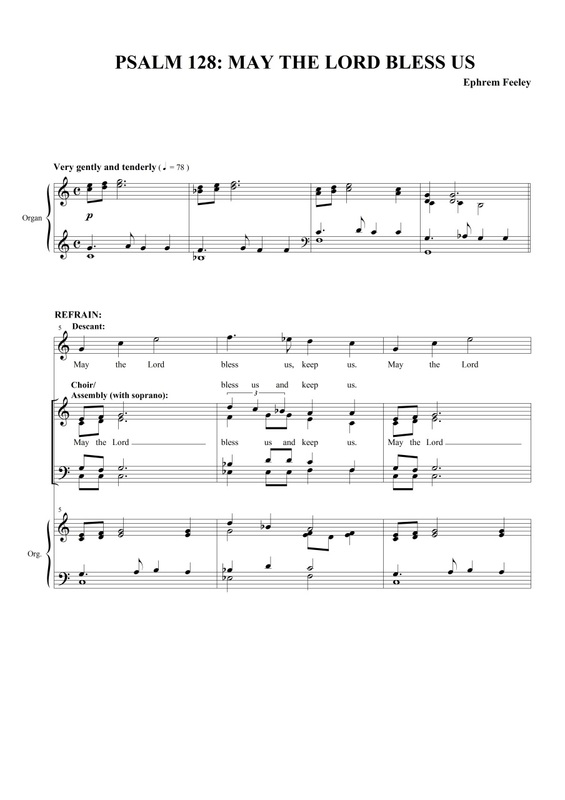 A vibrant refrain in 6/8 for assembly and SATB choir, along with psalm-tone verses for cantor make this a very usable psalm for the Feast of Christ the King, and Advent. 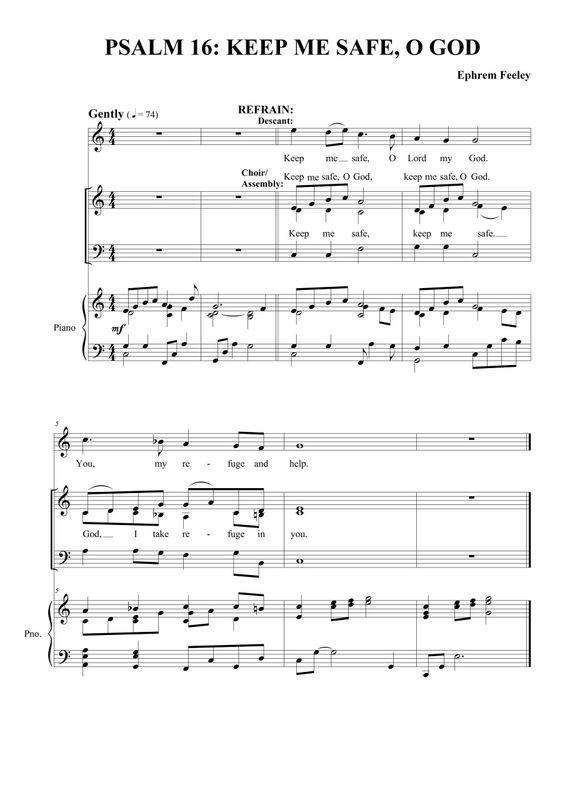 Suitable as both responsorial psalm for the Feast of Christ the King, and the season of Advent, and as a strong gathering hymn, this psalm is scored for assembly, SATB choir, descant, cantor and organ. 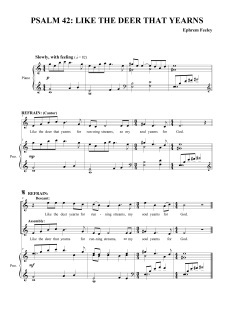 The strong 6/8 rhythm invites enthusiasm and captures the words perfectly. 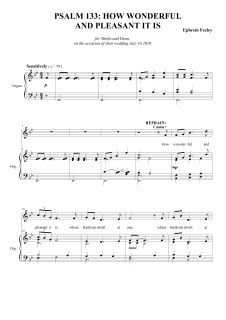 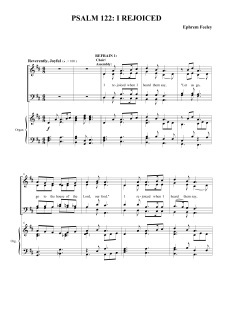 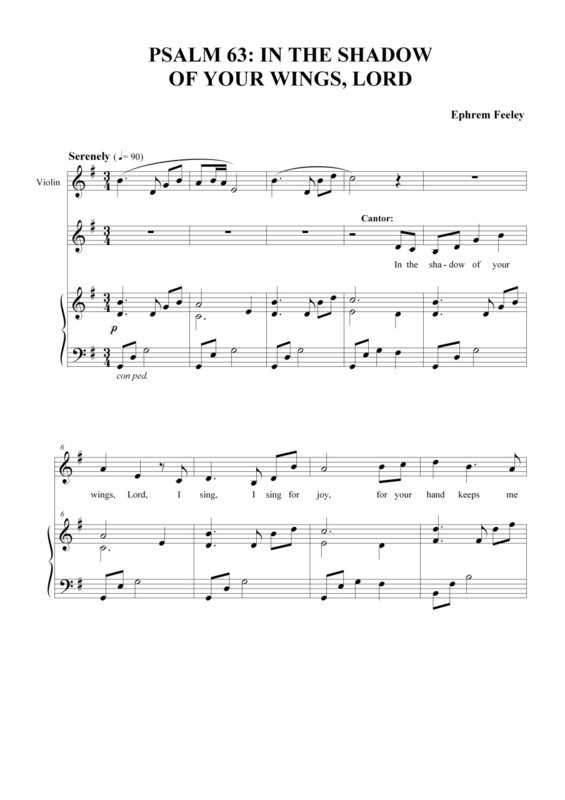 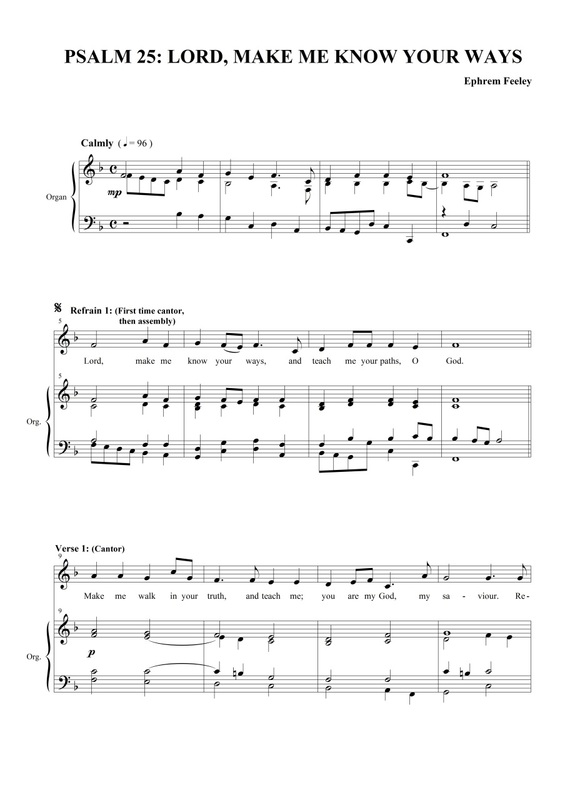 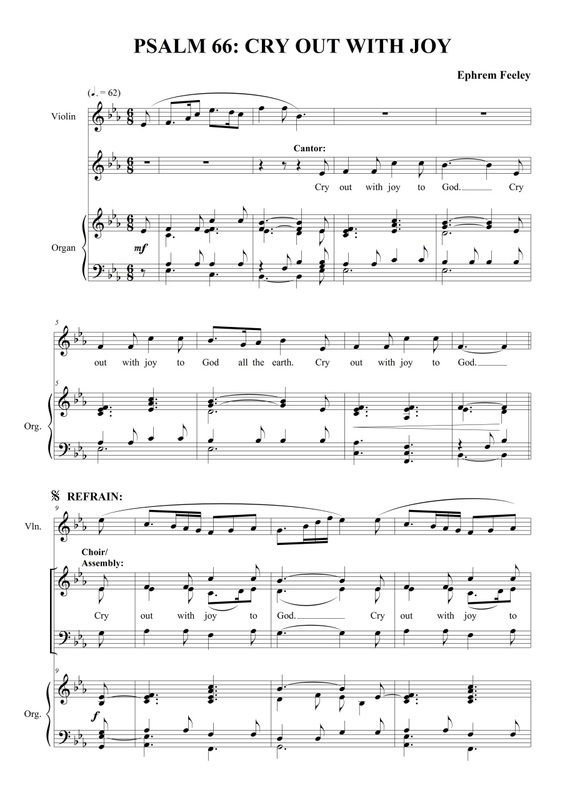 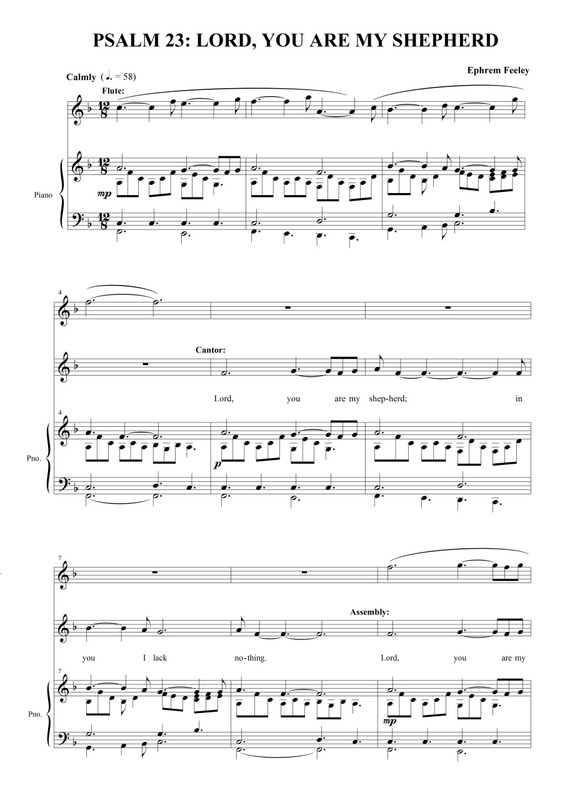 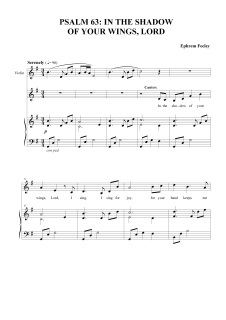 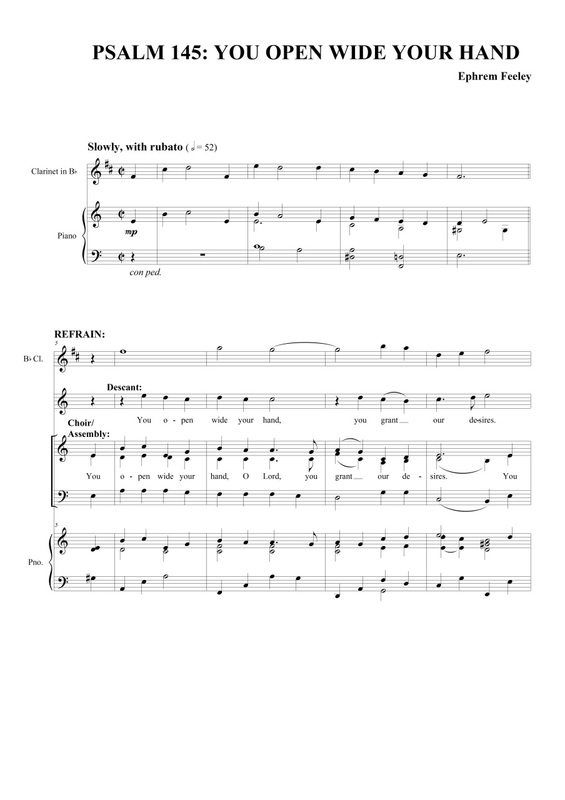 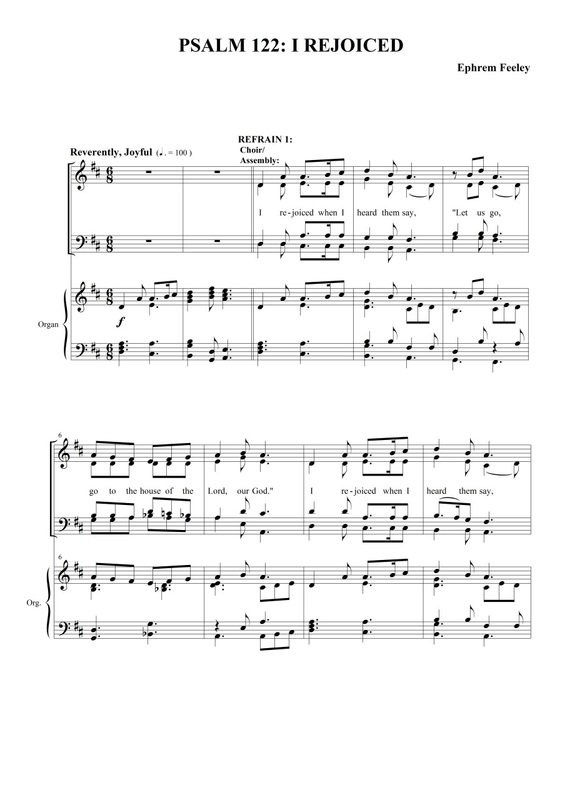 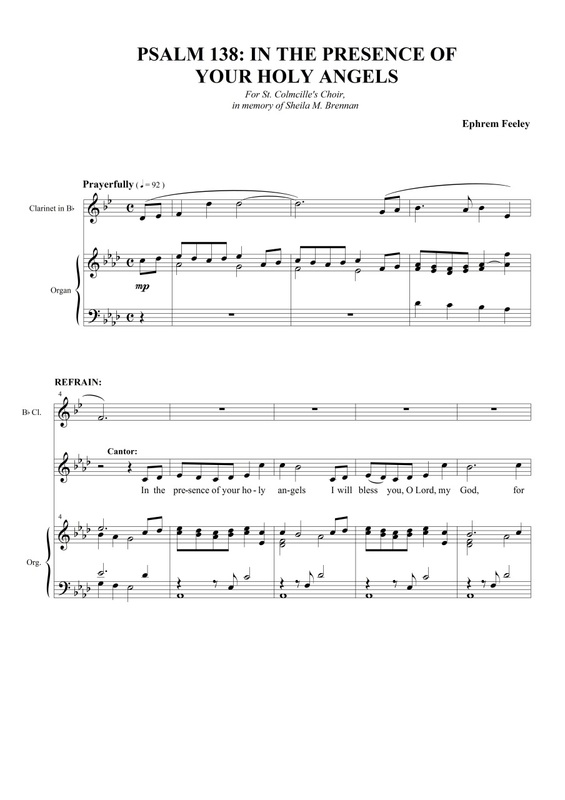 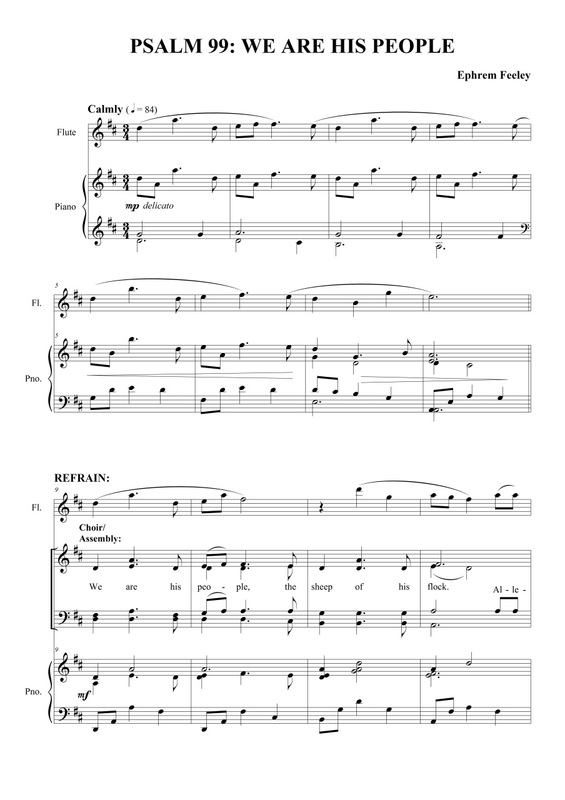 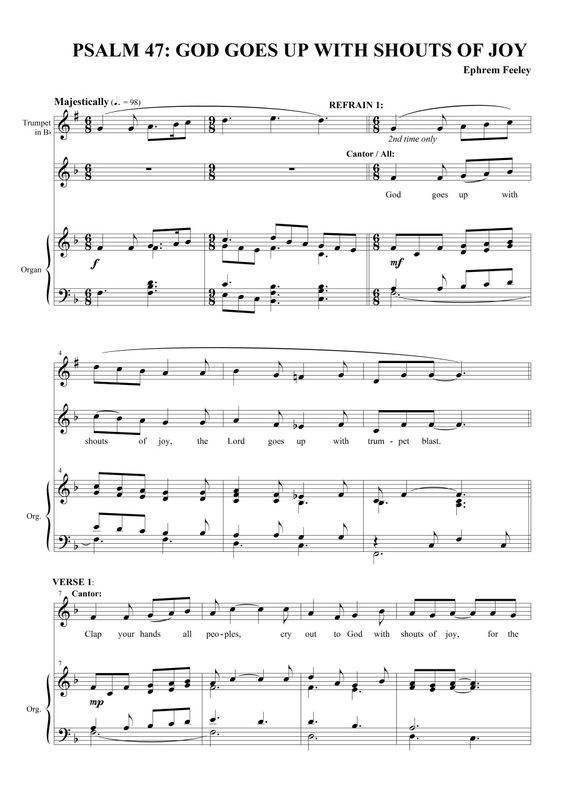 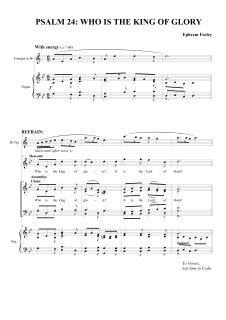 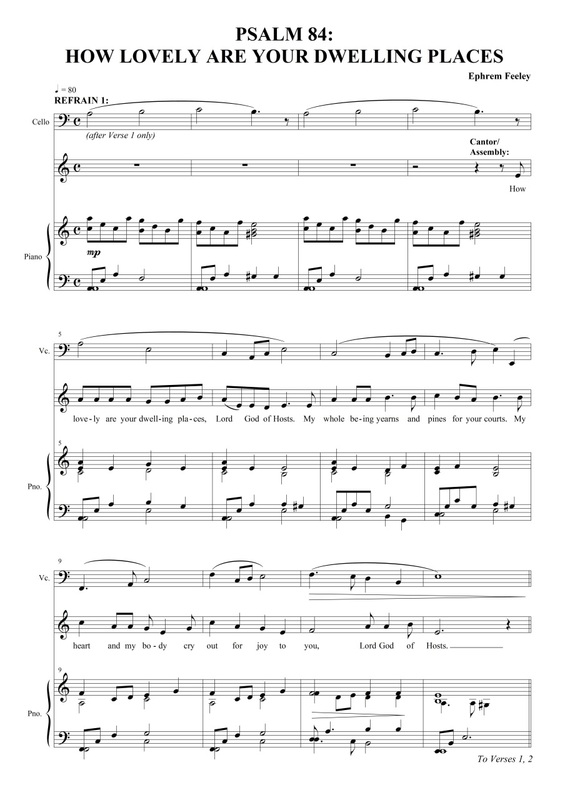 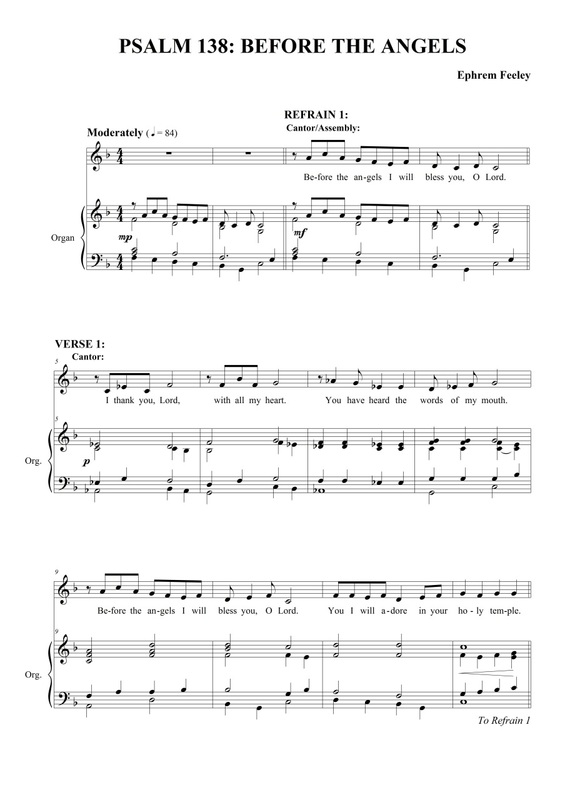 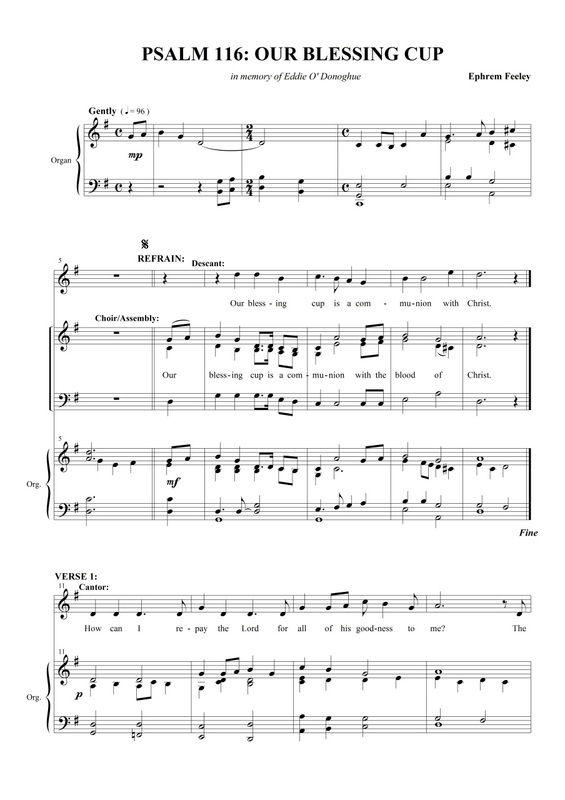 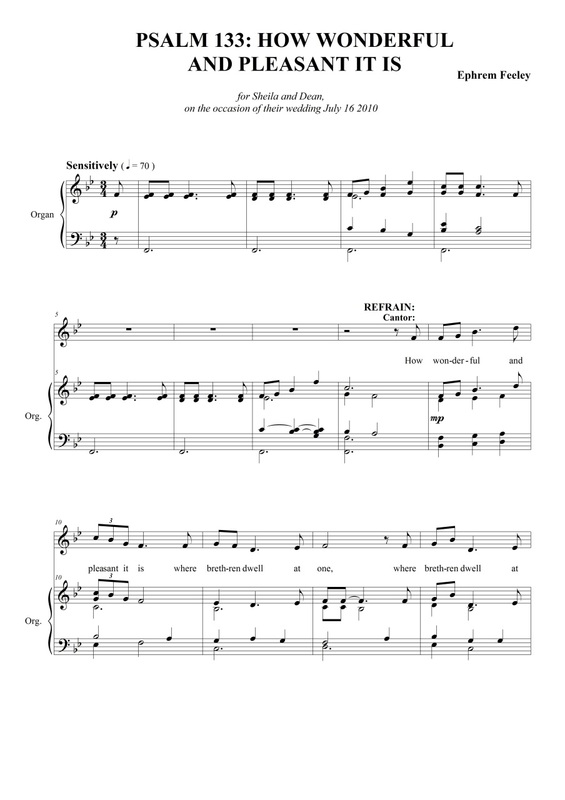 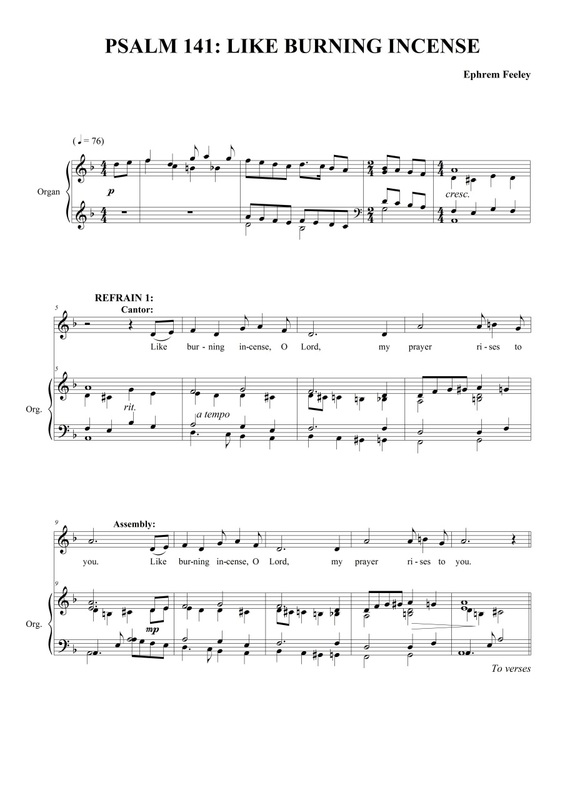 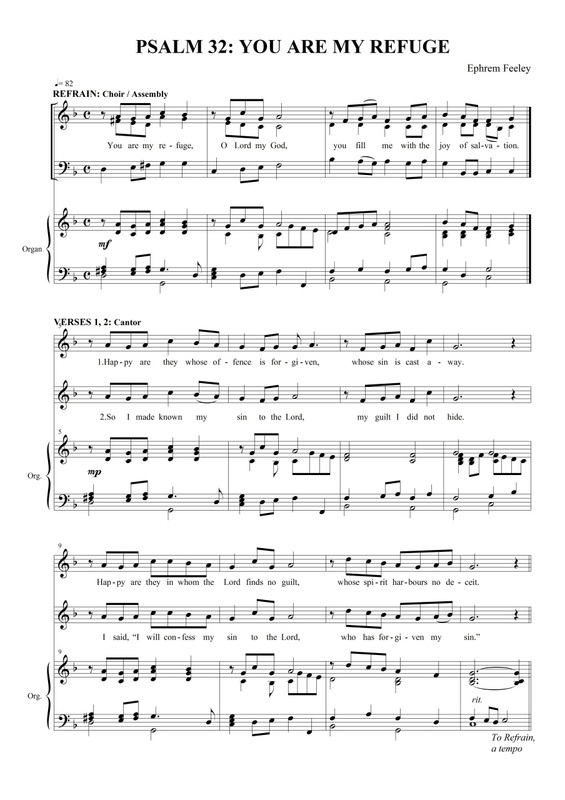 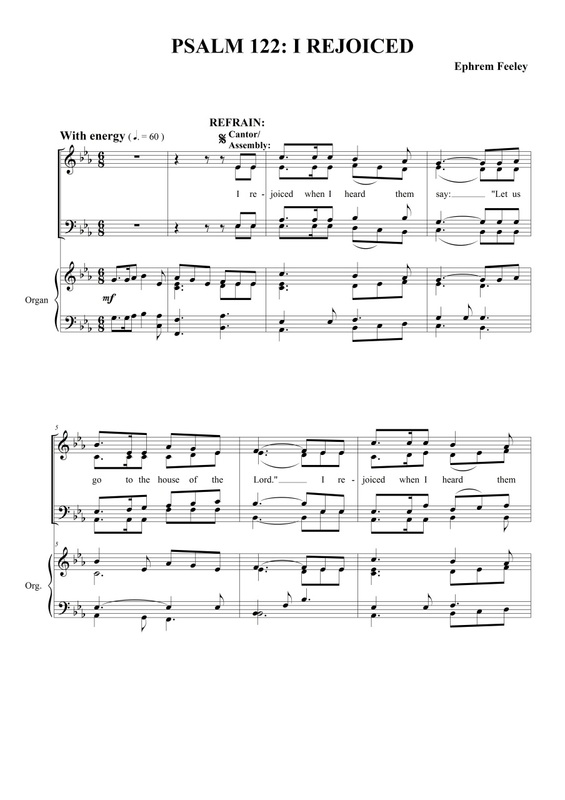 An energetic refrain in 6/8 for assembly and SATB choir, with rhythmic verses for cantor make this an ideal psalm or gathering hymn throughout the Easter season. 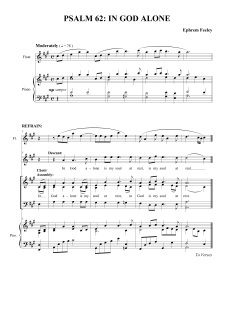 With its warm, gentle refrain from the Blessing of Aaron and verses from Psalm 128, this setting is suitable for weddings and services of commitment and renewal. 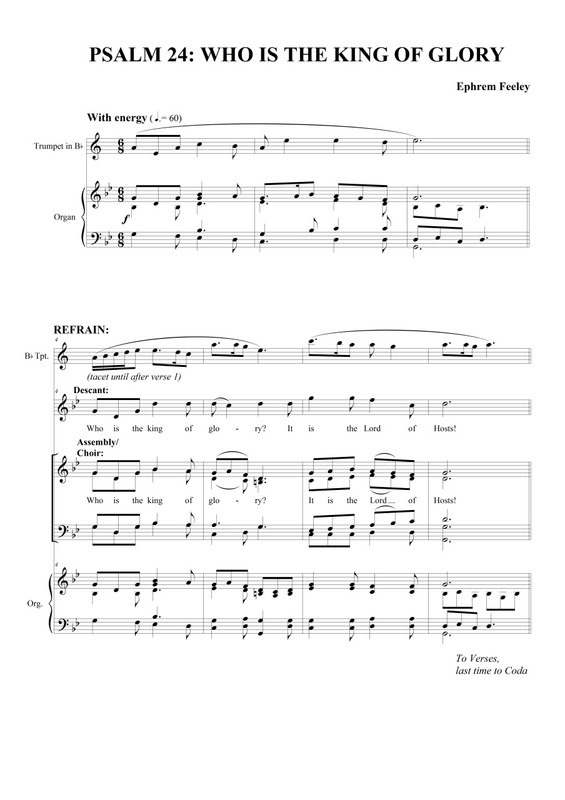 Scored for assembly, SATB choir, descant, cantor and organ. 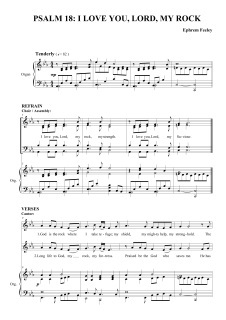 This psalm, which does not appear in the Sunday Lectionary, has many uses: weddings, services of Christian unity, reconciliation. 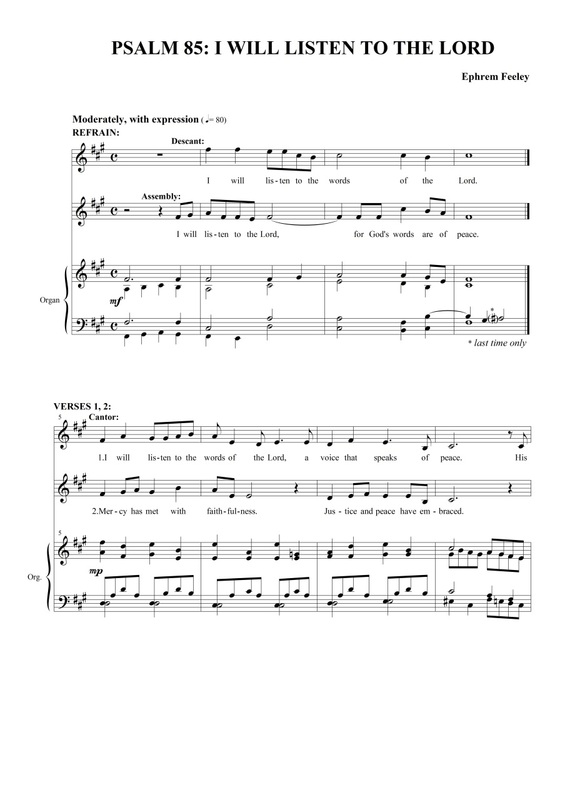 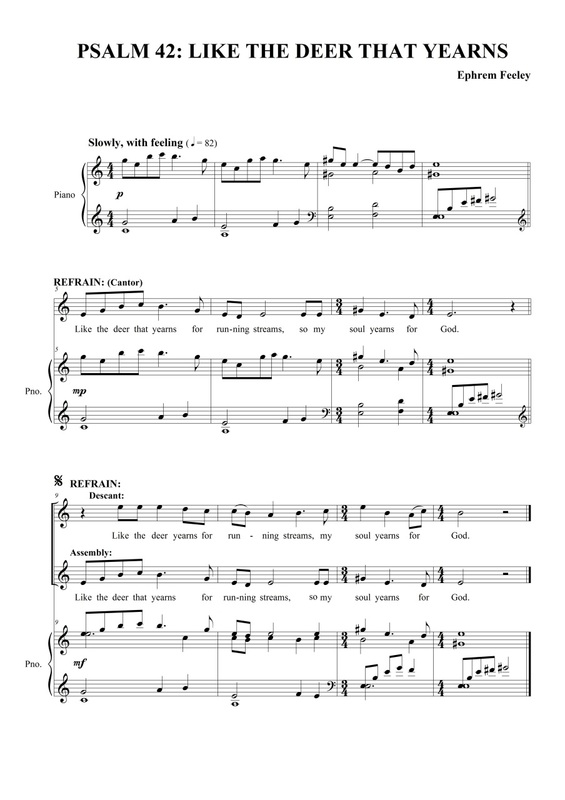 Originally written for ladies' choir, a version for SATB choir is also available. 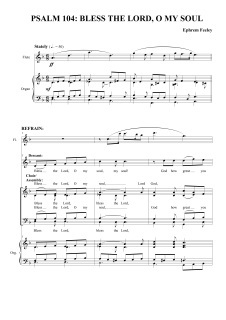 Capturing the sadness of the Israelites as they yearned for Jerusalem during the Babylonian captivity, this psalm also expresses the heart that yearns for God in the face of adversity, and is suitable throughout the season of Lent, and for penitential services. 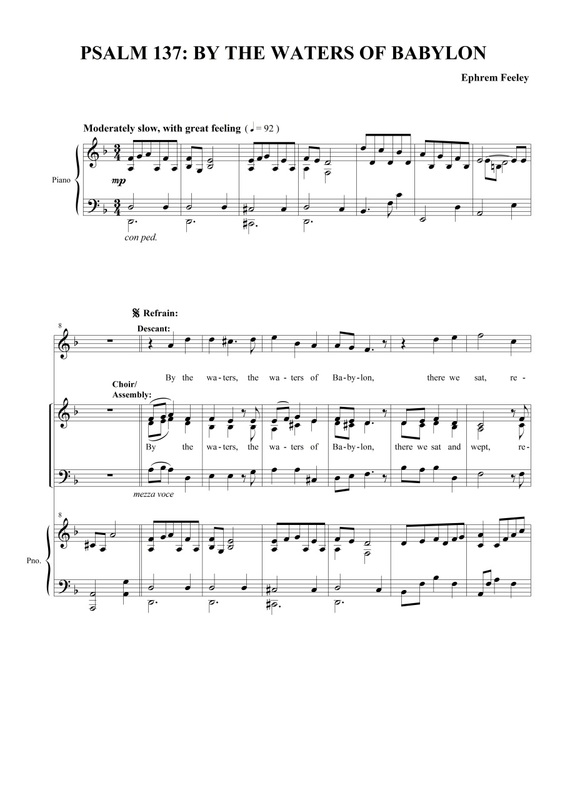 This setting is scored for two cantors, assembly, SAB choir, descant and piano. 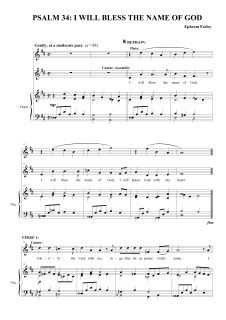 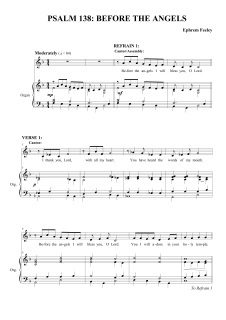 A simple psalm for assembly and cantor, with optional choral parts in verse 3. 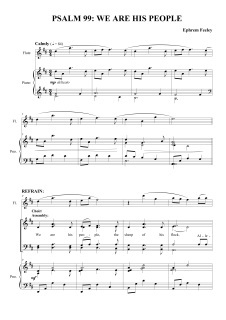 Suitable as a responsorial psalm or reflective hymn for funerals, rites of initiation or general use, this attractive, lyrical setting is scored for assembly, SAB choir, cantor, clarinet and piano. 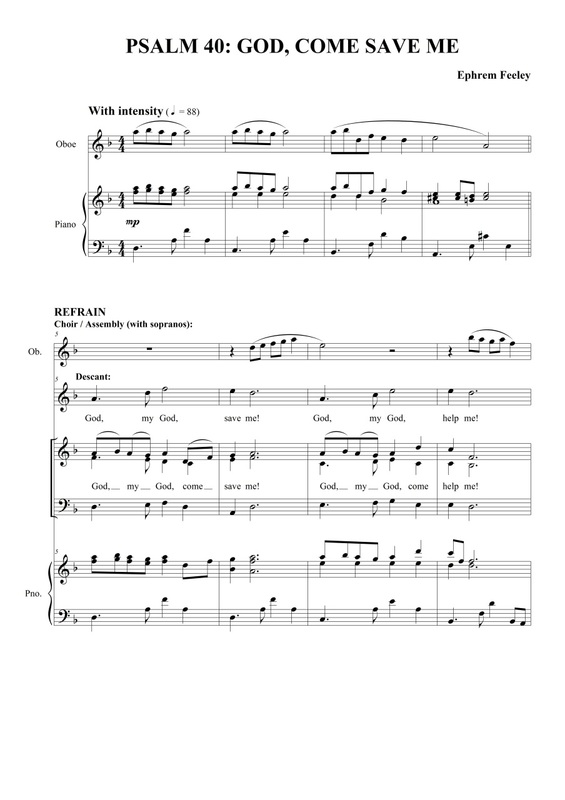 Suitable for Evening Prayer or general use, this setting is scored for assembly, SATB choir, descant, cantor and organ. 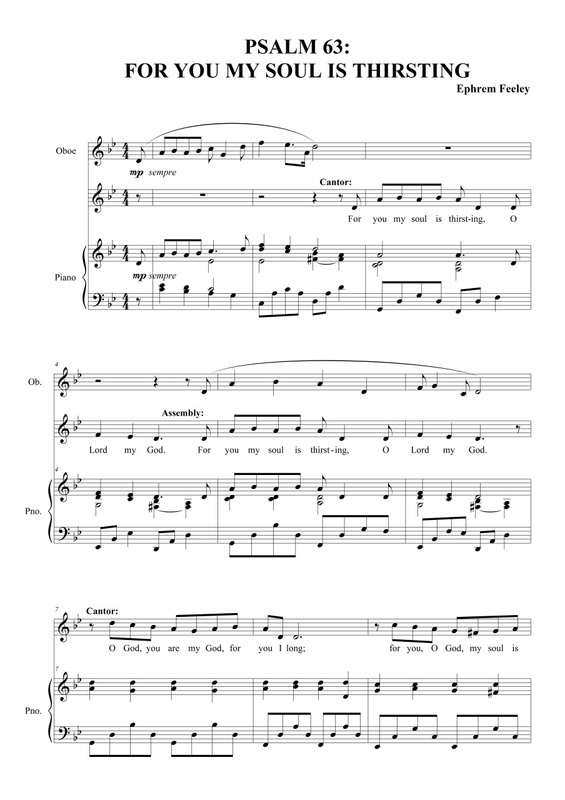 With its short, memorable refrain and lyrical verses for cantor, this psalm is suitable for funerals, weddings and use throughout the entire year as a responsorial psalm or reflective piece about the closeness of God. 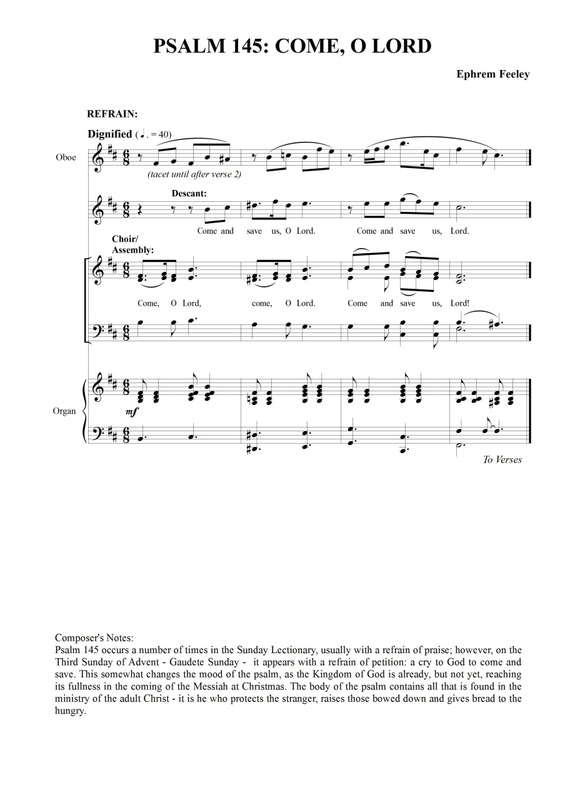 A simple, double refrain for assembly and SAB choir, with psalm-tone verses for cantor, this setting is suited for Harvest festivals and use throughout the church year. 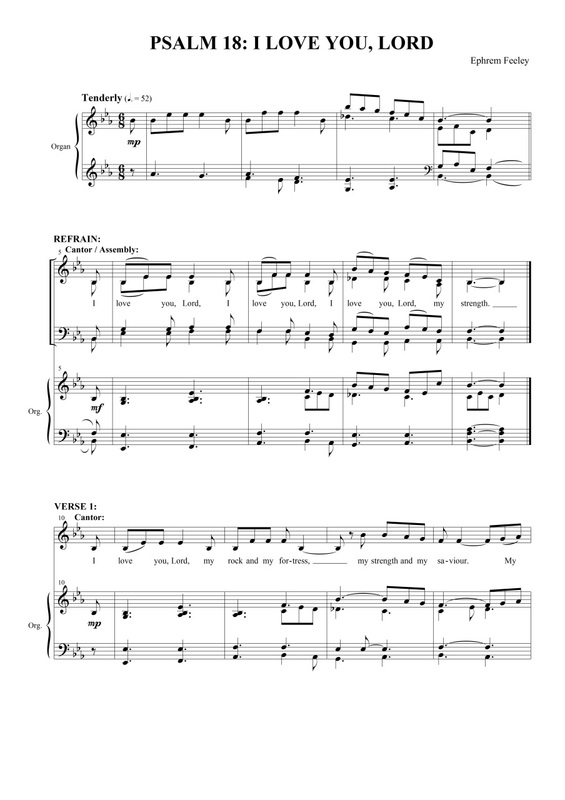 An optional clarinet line gives a plaintive touch. 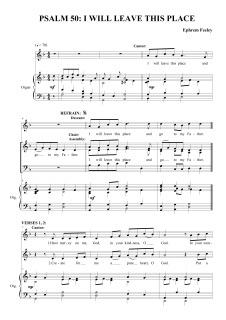 A gentle hymn of praise, suitable as a common psalm throughout the year. 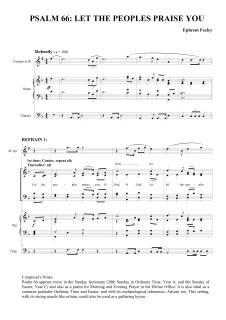 Scored for assembly, SAB choir, descant, cantor, violin and piano. 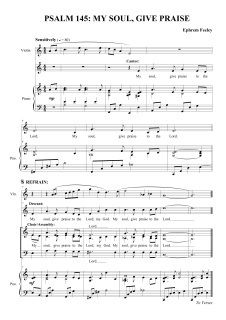 Suitable as a common psalm for Advent, this setting has a short memorable refrain, and easy-to-learn verses for cantor. 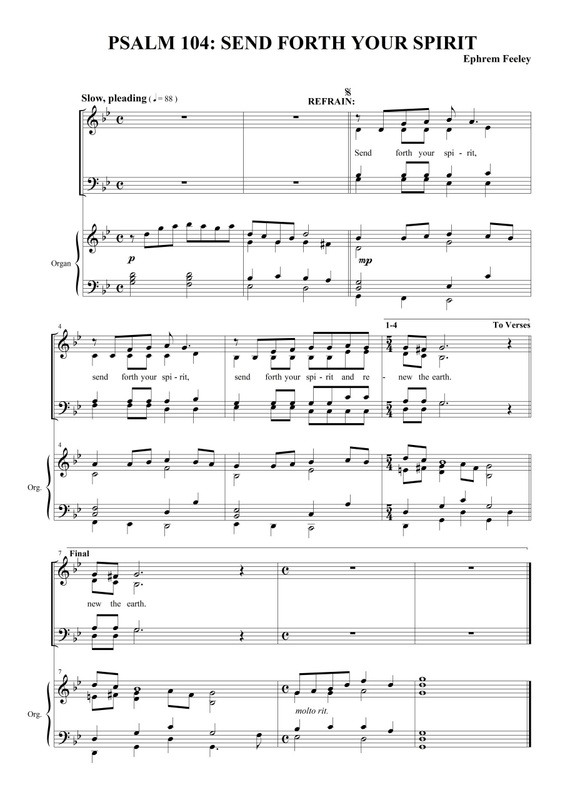 The addition of an oboe part adds to the plaintive nature of this piece, which also has harmonies for full choir.